Spring is a time I am normally found out and about with my camera looking to see what is afoot. 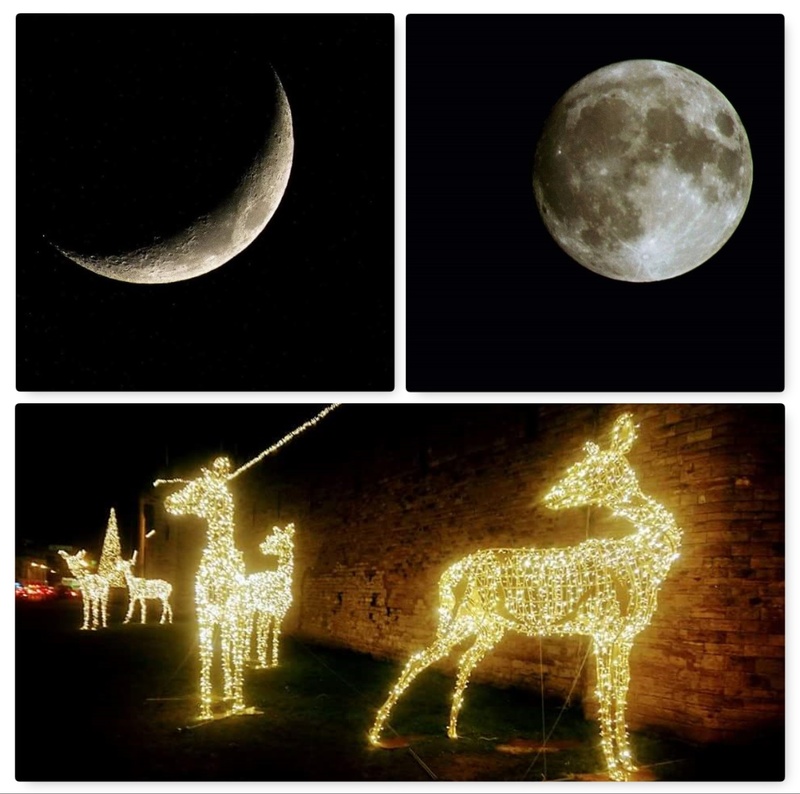 This year my work has kept me much busier than usual so my usual bimbles have been curtailed slightly – though some may disagree 😉 I did though get out a little and here is a little taste of my bimbles this last month. 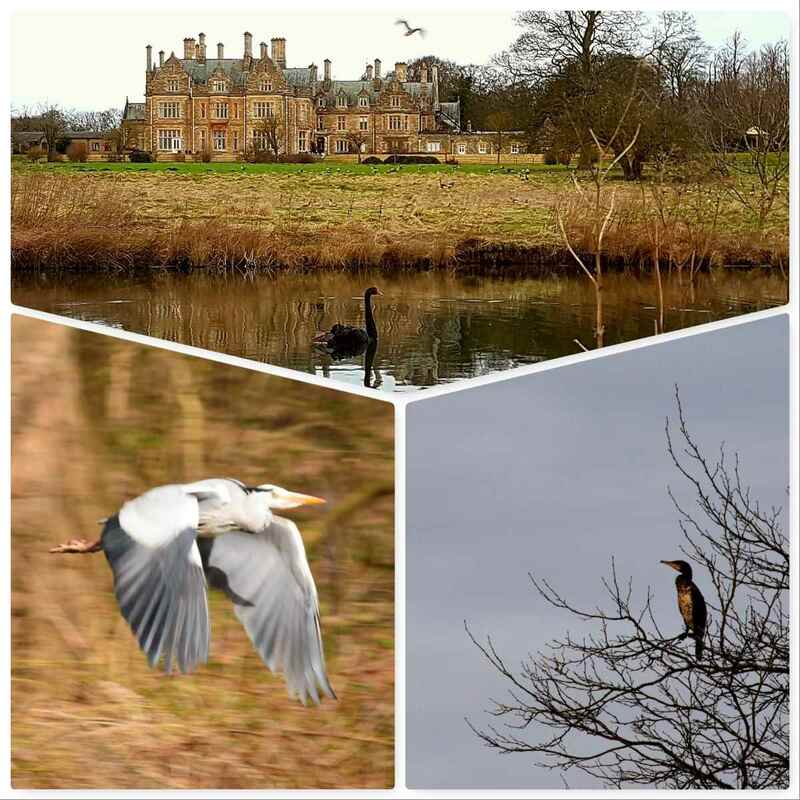 Early in March I was at a conference in Lincoln and as all the town centre hotels were full I ended up at the Branston Hall Hotel on the outskirts of Lincoln. As soon as I booked into the hotel I was straight out to explore its beautiful gardens. There was not much in the way of wild flowers about but the local birds put on a fantastic display. The Black swan was majestic, the Cormorant stayed aloof and kept an eye on me and the Heron came blasting by. When I am out and about I keep a little pocket hammock seat (the EDC Hammock) in my bag. 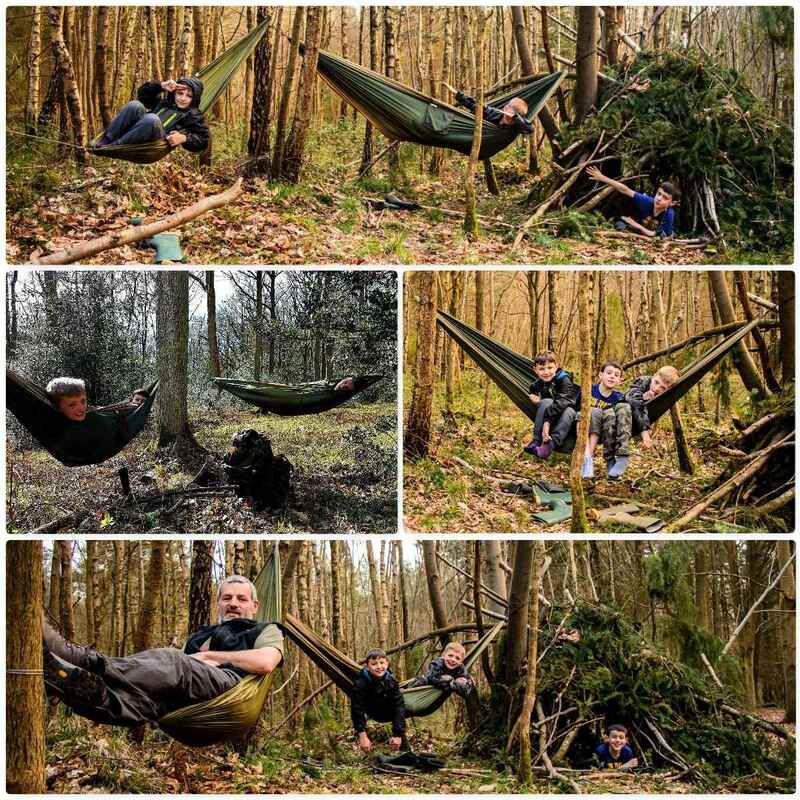 As I was out on a couple of trips with the kids and their pals I needed to carry an extra hammock with me. We did lots of exploring but we did a lot of relaxing as well – the kids just loved using the hammocks and I was always hard pushed to get them out of them. 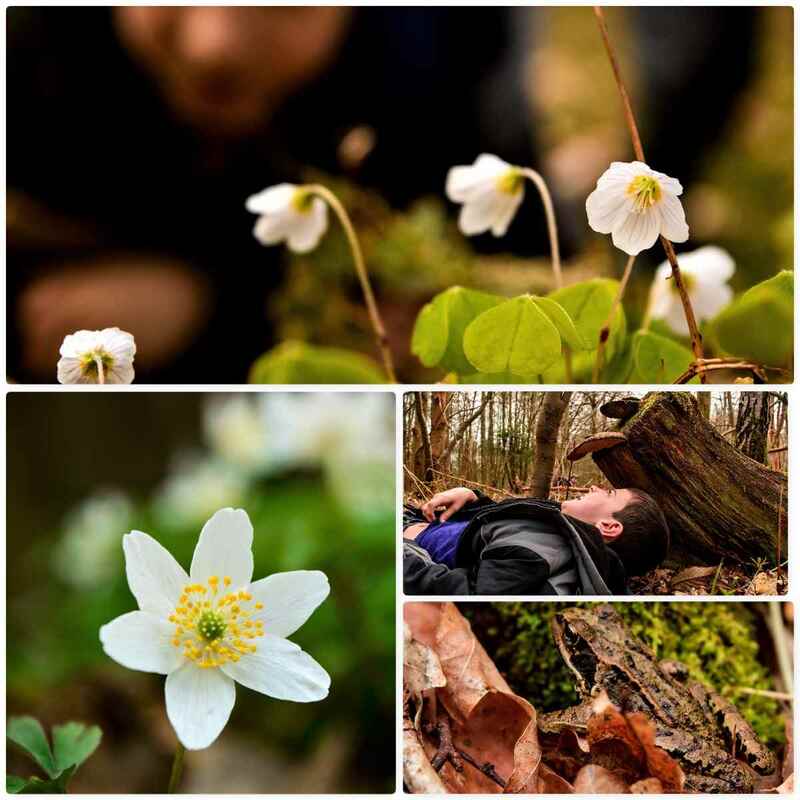 Over the last two weeks the early spring flowers like the Wood Sorrel and the Wood Anemone have started to appear. They are so easy to pass on by but when you get down close their beauty really shines through. 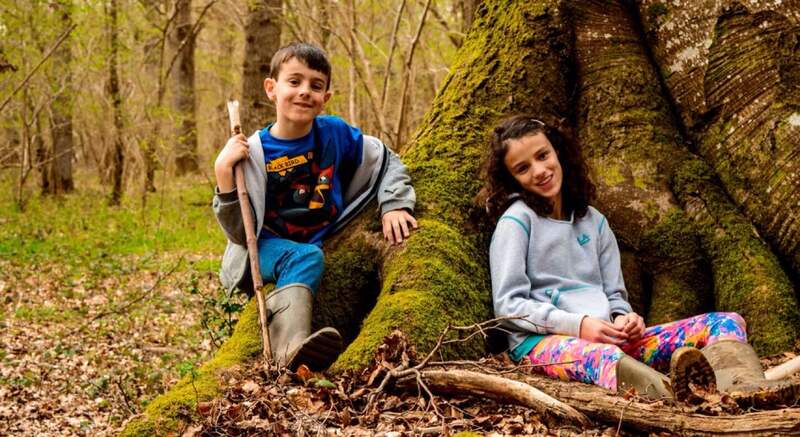 Last weekend I was in our local woods at Pamber with my family and our friends Katie and William. 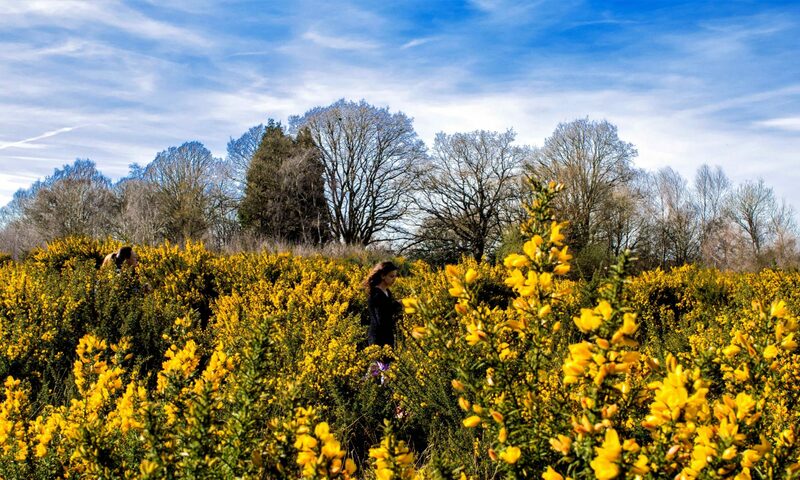 The weather was gorgeous and the gorse was in full bloom making for a blaze of colours to photograph. I took the picture of my shadow as it struck me I looked like a Teenage Mutant Ninja Turtle – comes with having a nine year old son in the family I suppose. As we move into April there will be another riot of colour and I hope a few more bimbles. 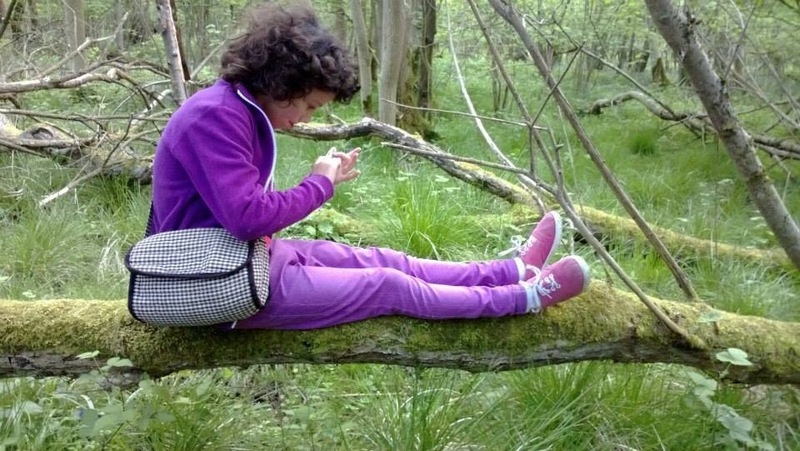 Yesterday I picked the kids up from school and instead of curling up in front of the Xbox or the iPads off we went to the woods. I know we get out to the woods on a regular basis however not normally on a school night. I did not know what we would do with our limited time but as it turned out it was surprisingly a lot. 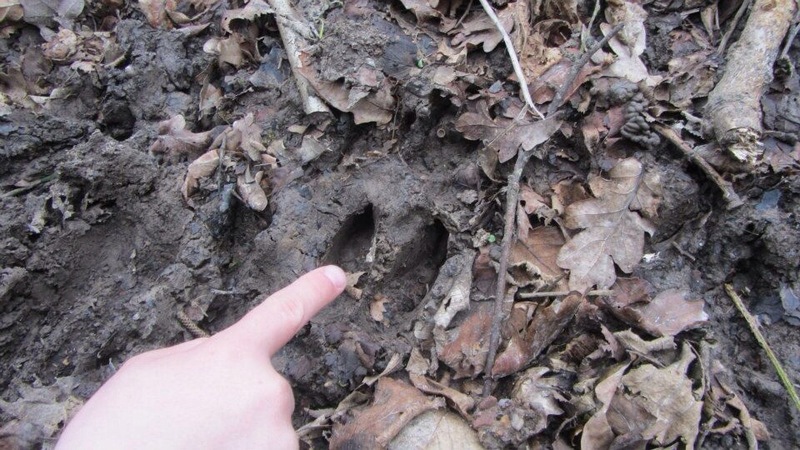 As soon as we got into Morgaston wood the kids picked up some deer tracks and after sitting for five minutes we were rewarded by spotting a deer crossing one of the paths. As we trundled along I got them to find some fungi. There was not much around but we did get some King Alfred’s Cakes, some Birch Polypore and some Artists fungi. The Bluebells were really coming out and there were plenty of Primroses around. Just on the edge of the wood though we spotted our first Cuckoo flowers by a ditch. This is a sturdy little plant as it grows in some really exposed areas however it does have a very dainty look about it. This was a challenge to myself as I had to watch every step I took in case I re-opened my torn calf muscle – It was worth the effort though. 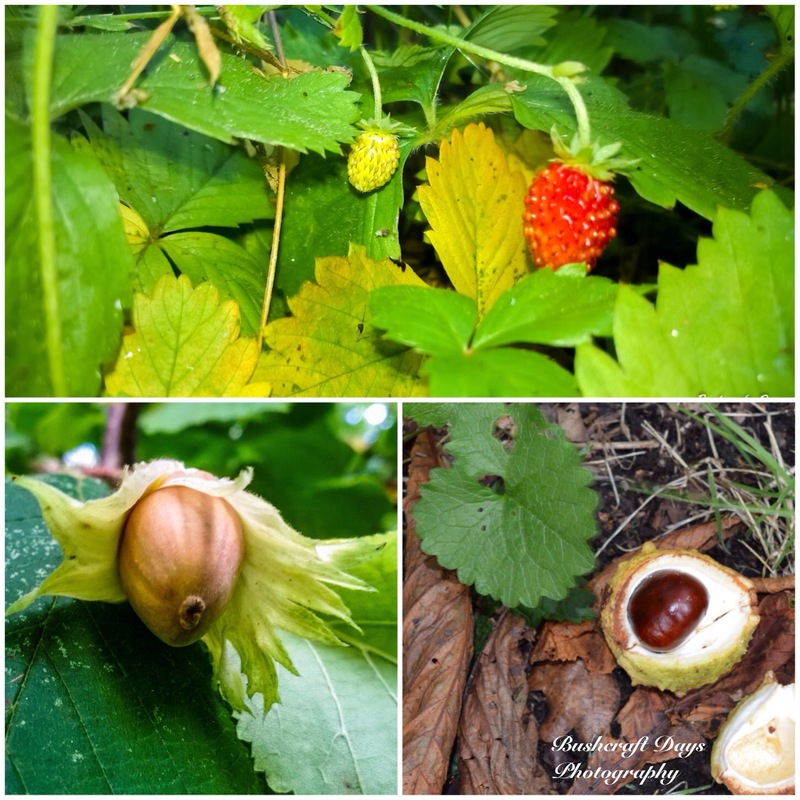 This year I have had real fun trying to capture just a little bit of the nature I see around me when out and about on my adventures. I have had a look through some of the nature pictures I have taken this year selected the ones I have fond memories off. 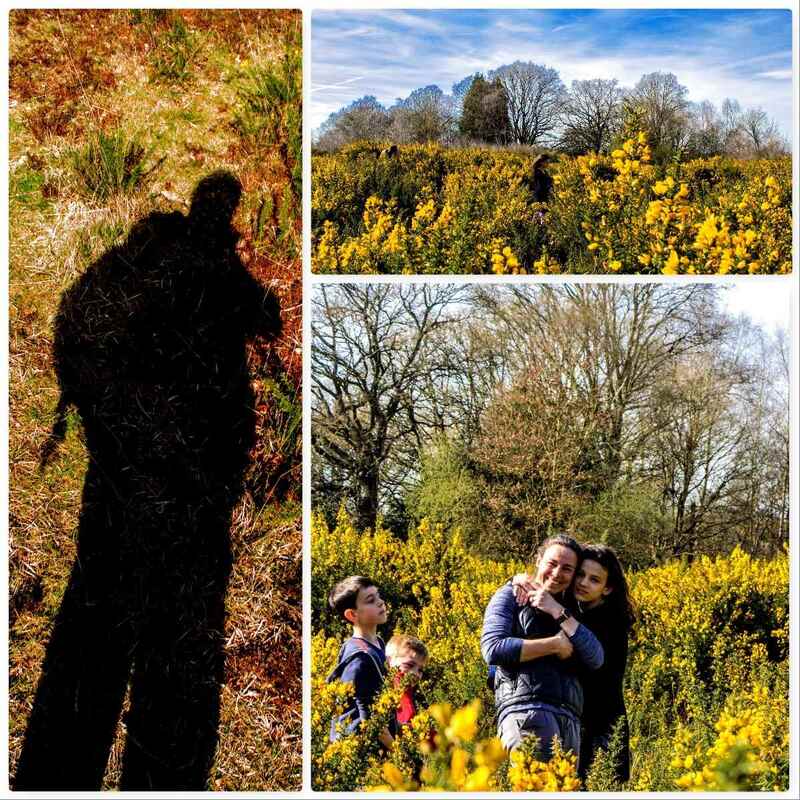 I went to the Brecon Beacons in the Spring with a few of my friends from Crisis and while walking along the banks of the Afon Mellte river near Ystradfellte I was struck by all the spring flowers emerging but it was something else that really caught my eye. I initially walked passed these emerging Fern Fiddleheads. I stopped myself as I realised that they would make for a cracking shot if I got down low. I am glad I went back as they are quite magical looking when you get down low (I did have some passers-by step around me as I lay in the path). I often take a bimble around my village photographing wild flowers and rarely do I pay much attention to the mass of wheat being grown in all the fields. I was though stopped in my tracks by this dainty little picture. It was not until I got the picture up on the computer did I realise how beautiful it would look. 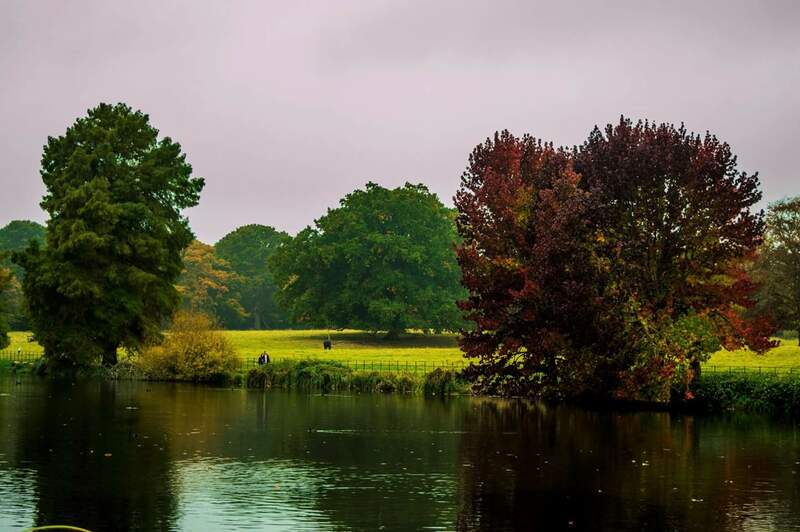 These are two pieces of nature that you would not normally pay the slightest bit of attention to however when they come together they end up looking like a painting. 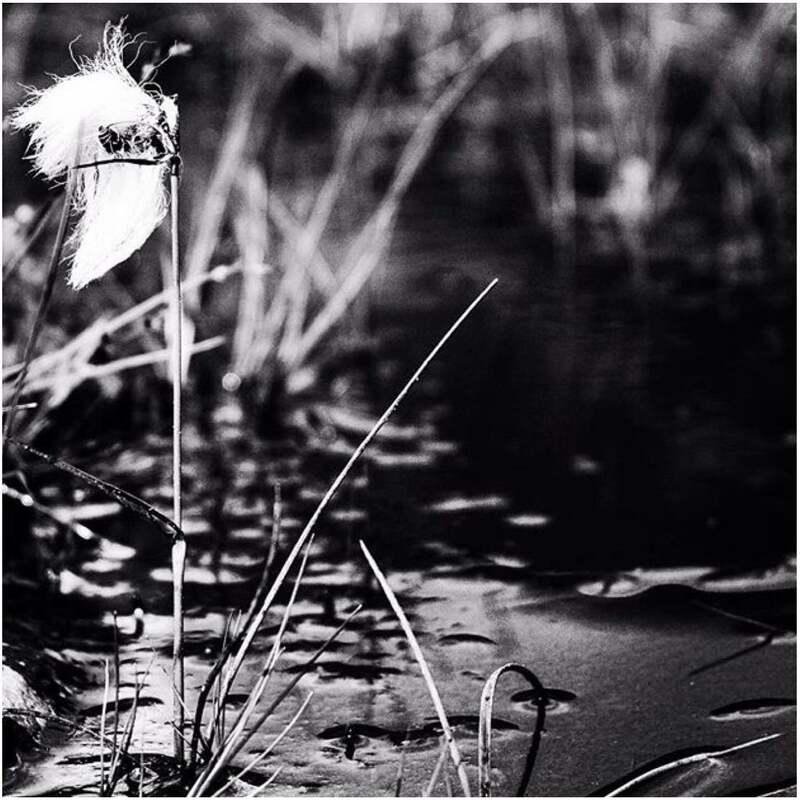 I have dabbled a bit in Black and White photography this year and felt that this shot of some Cotton Grass lent well to that style. I was really struggling to find some interesting shots while up in the Lake District this year and so ended up lying face down in a bog to get this shot. Well worth it though in my opinion. I really love to explore the art of Macro photography and have now got a couple of tripods and lens to help me with this. While in France on a wet morning I was walking with my friends Simon and Rick and came across these Damson Berries. Problem was I did not bring my tripod along with me. 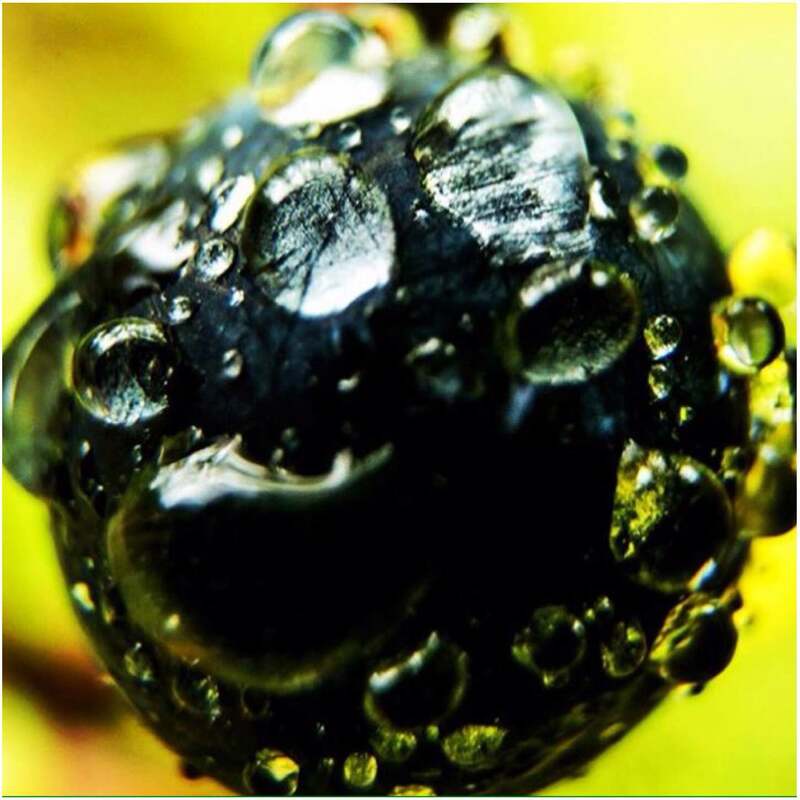 I must of taken about 50 pictures of this berry and this was the only one that was properly in focus. A real fluke but one I am glad I persevered with. We had a busy time running a Basic Expedition Leadership course for Sea Cadet instructors this year. While waiting for them to appear out of the woods on a navigation exercise I decided to try out an experiment. I positioned myself by a fallen log and focussed on some fungus on the log. As the guys passed by I took the shot and I think I can say the experiment worked pretty well. 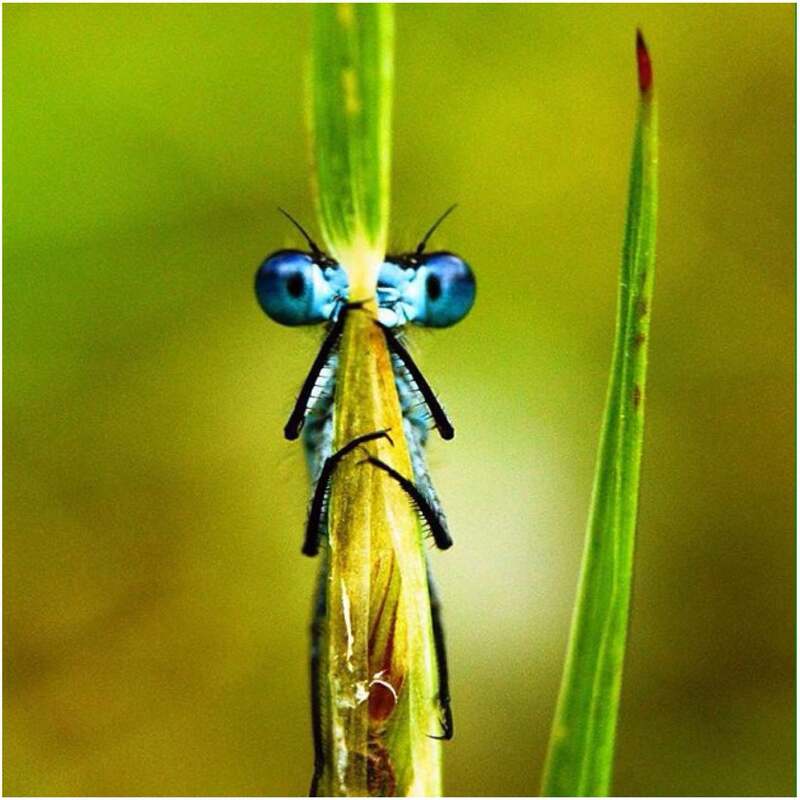 I cannot remember where I took this picture but I do remember seeing this little guy perched on the upturned tip of a succulent leaf. 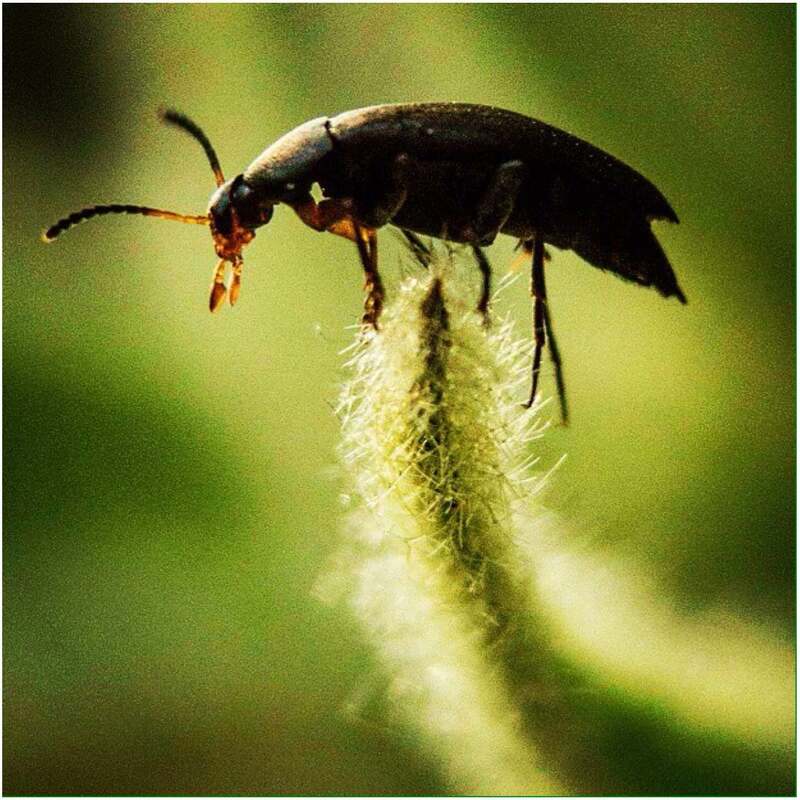 I took the shot as I could make out through the lens that his legs were resting not on the leaf but on the hairs protruding from it. I sat watching him for about 5 minutes and he did not move once – it was as if he was on some sort of guard duty. For some reason this year spiders webs have been out in force. 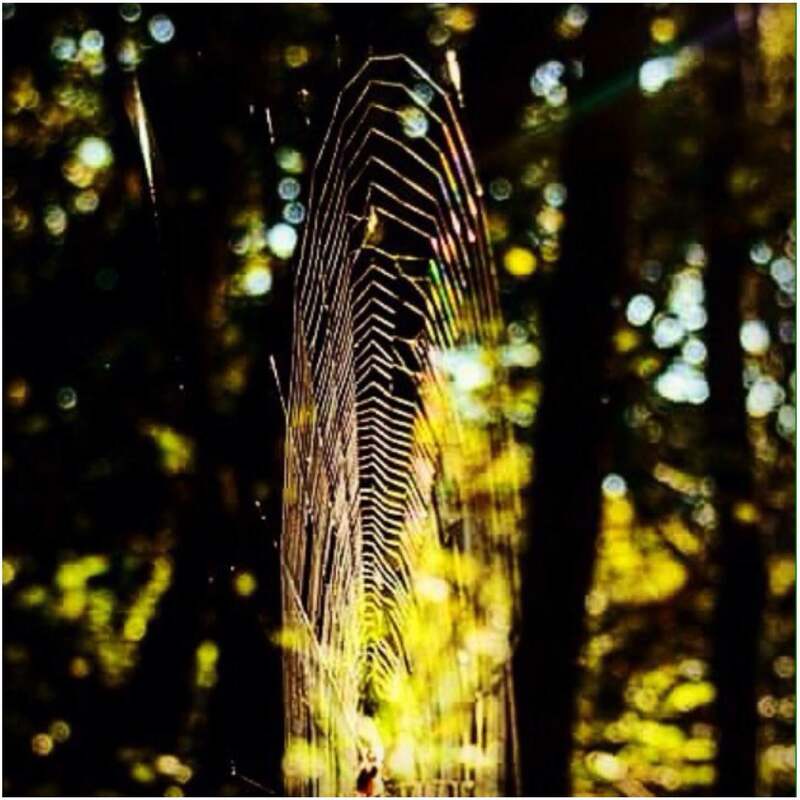 While in the Ashdown Forest my friend Charlie spotted this amazing web that was strung between two trees. The trees were about 20 feet apart and when photographed from an angle a rainbow appeared in it. I did not see this at the time of taking the picture but had it pointed out to me by my wife Alison and my friend Eleanor. Kind of took me back a bit as I did not see it at all – maybe it is just a camera thing. 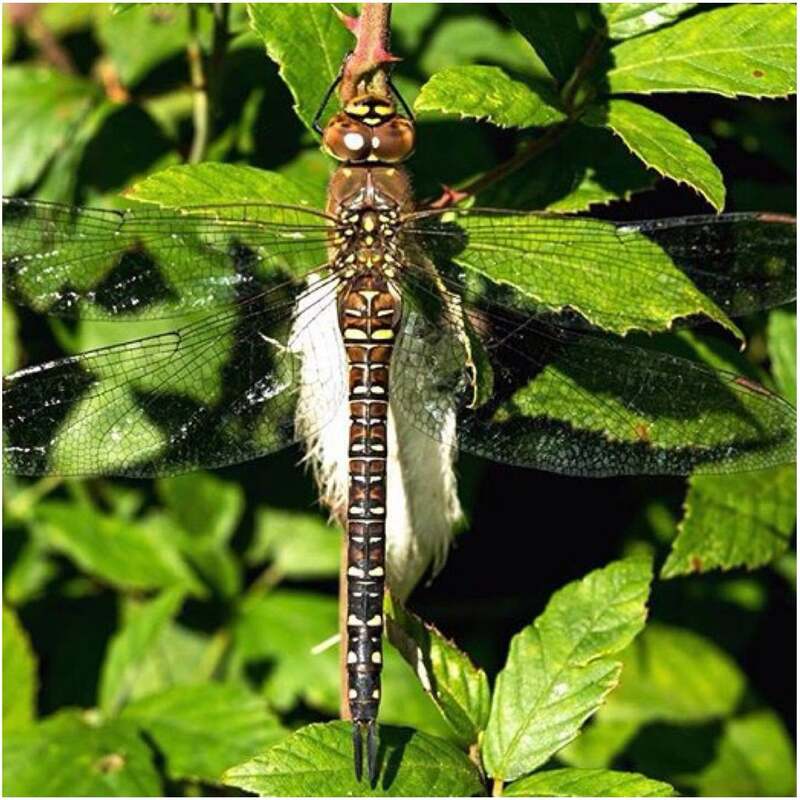 My daughter spotted this little Dragonfly resting up at our local Church when I was running a Bushcraft stand at the church open day. She came running up to tell me but I was teaching bowdrill and had to tell her to wait. I thought he would have been gone by the time I walked over but thankfully he was still there. Looking closely I could see why – he was sitting comfortably on a little downy bed sunning himself. This is another one of these pictures that you take and only realise something was happening afterwards. 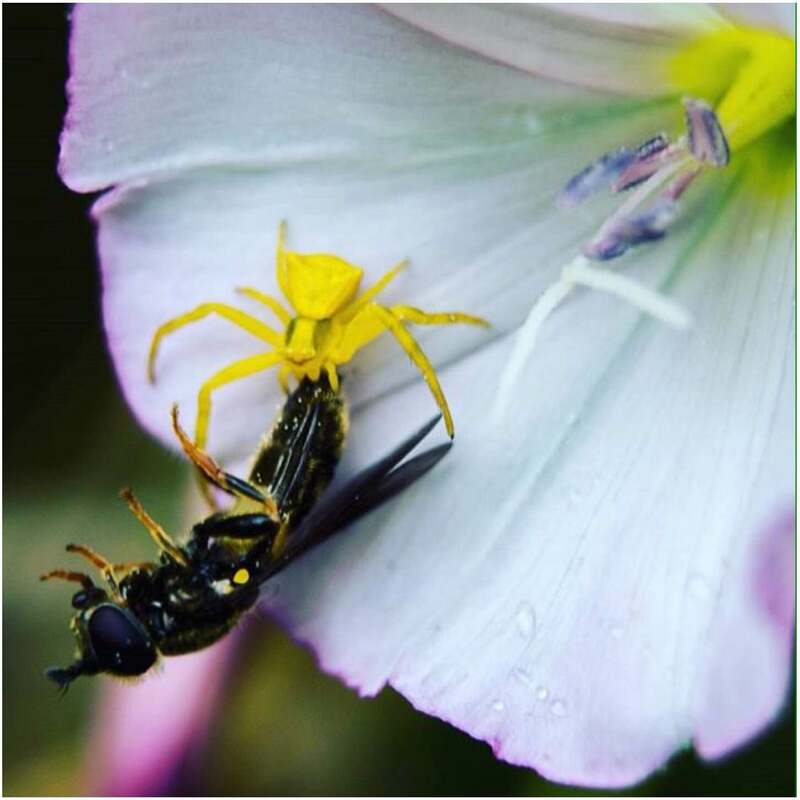 It was taken in Southern France on an unidentified flower. I had spotted the small spider but that was all. Later when processing the picture in Lightroom I saw that he had caught and immobilised a small wasp. I wish I had spent more time watching what was going on but at least the spider got his lunch. 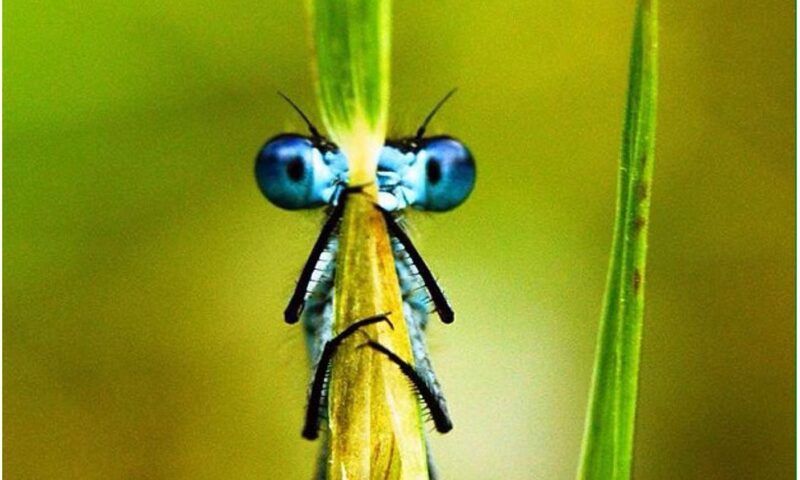 This has to be my favourite nature picture of the year. 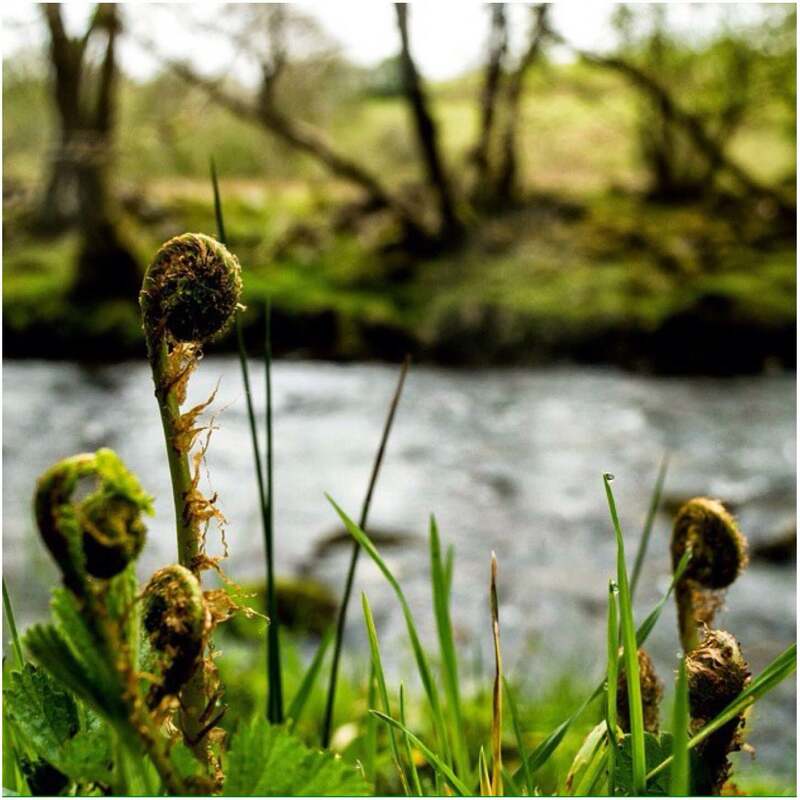 It was taken by the banks of Coniston Water in the Lake District while assessing a Gold DofE Expedition. I was waiting for the teams to appear at a check point when I started stalking Damselflies – probably looked a bit of an idiot ;-). I used my extension rings to get a bit closer and this little chap was not fazed by me at all (unlike most of the others who soon flew off). 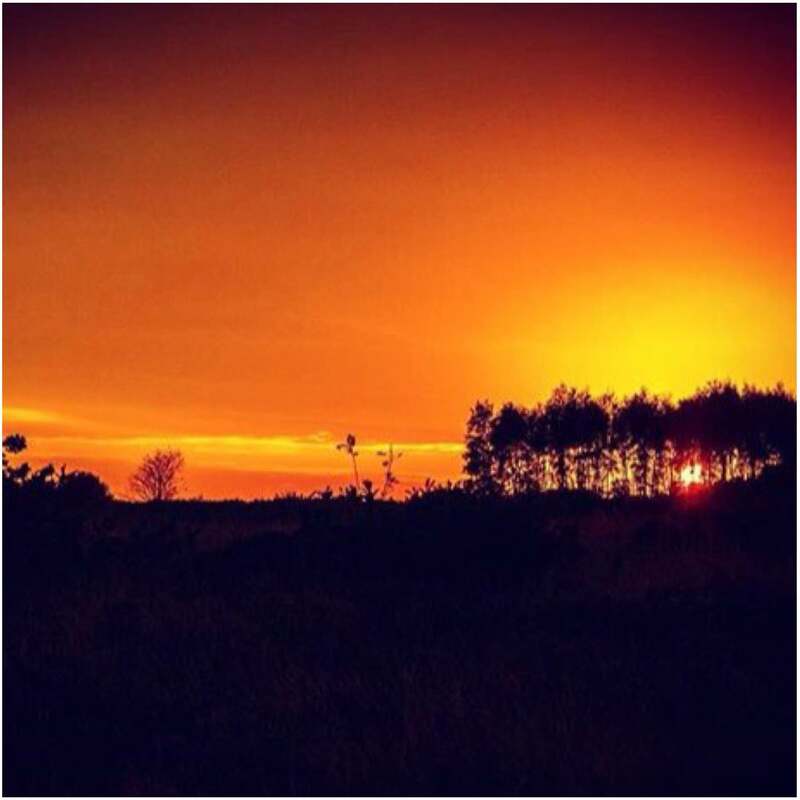 Thats it for my nature memories so I will finish up with this rather nice sunset taken off Kings Standing in the Ashdown Forest. I have really enjoyed capturing nature images over the year and will no doubt be out and about looking for more beautiful and unusual images next year. My last post in this series will be on the Memorable Moments I have had in the last year in the world of Bushcraft. 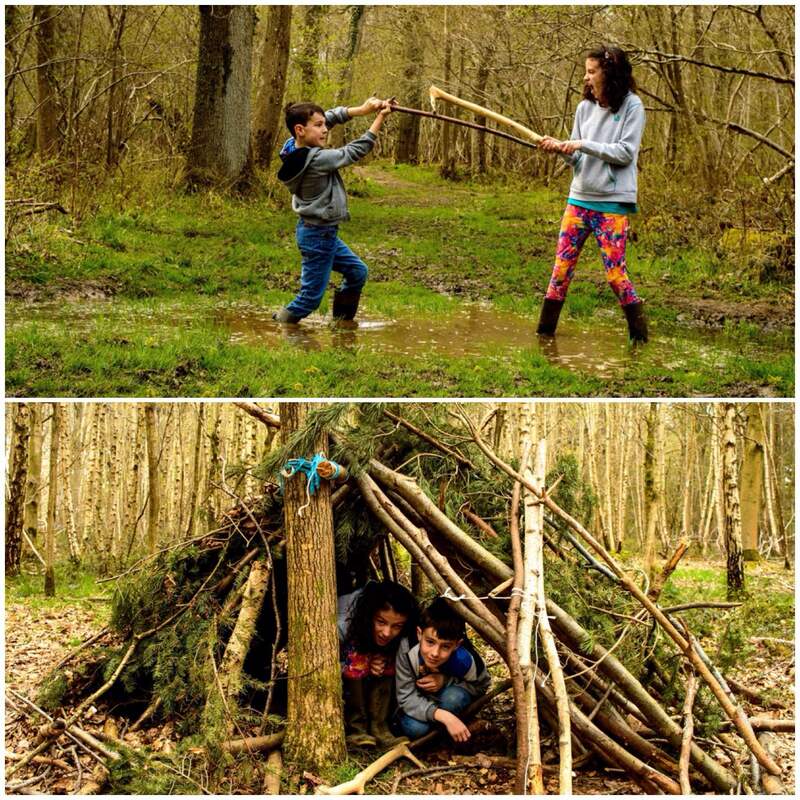 Back in October last year I heard that my good friend Mollie Butters would be demonstrating some of her many bushcraft skills at our local National Trust (NT) property – The Vyne. 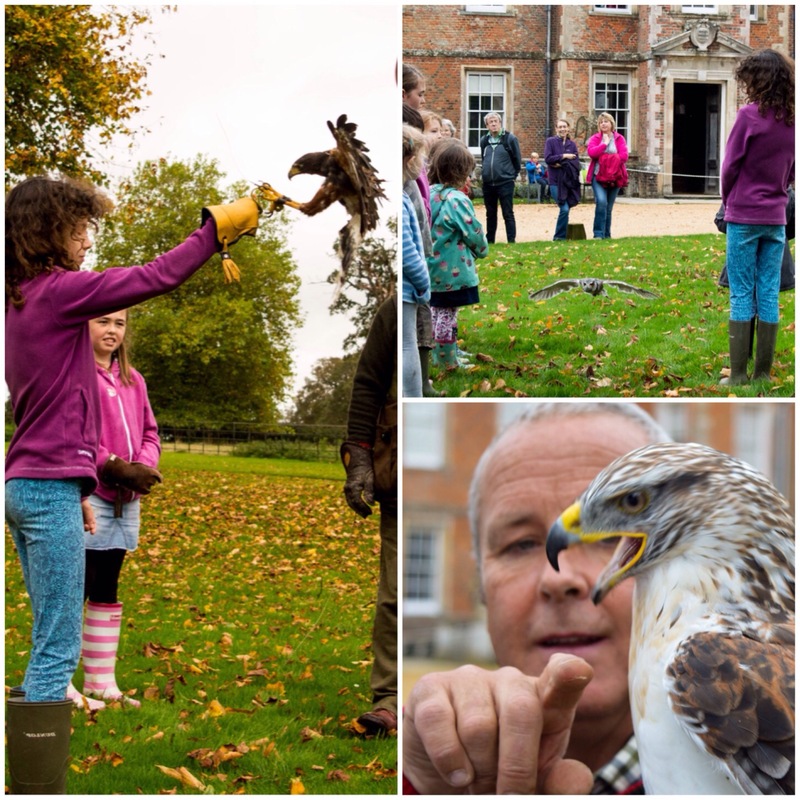 The whole family were keen to go and this is a little report on our wonderful day. I met Mollie while studying bushcraft with John Rhyder at Woodcraft School back in 2008 and have been firm friends since. 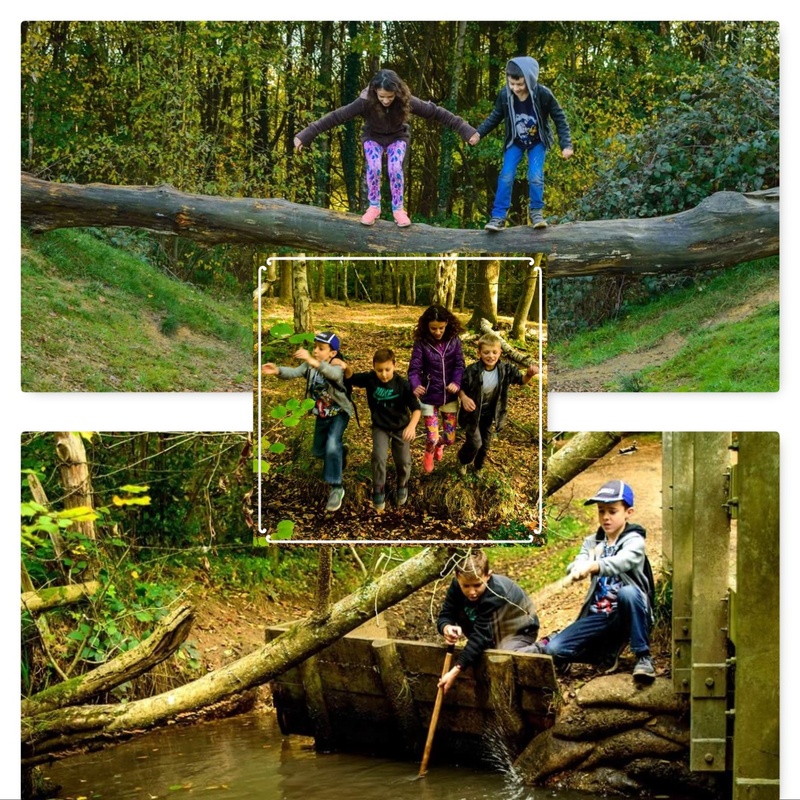 Mollie has set up an outdoor education school called the Field Farm Project with her partner Nick McMillen and to quote their Facebook page it is ‘an exclusive mix of woodland crafts, field studies, farm life, horticulture, ancient crafts and technologies – combining to provide a rich and inspirational learning experience‘. Mollie had already set up her stand when we arrived and had a lot of her beautiful creations on display. 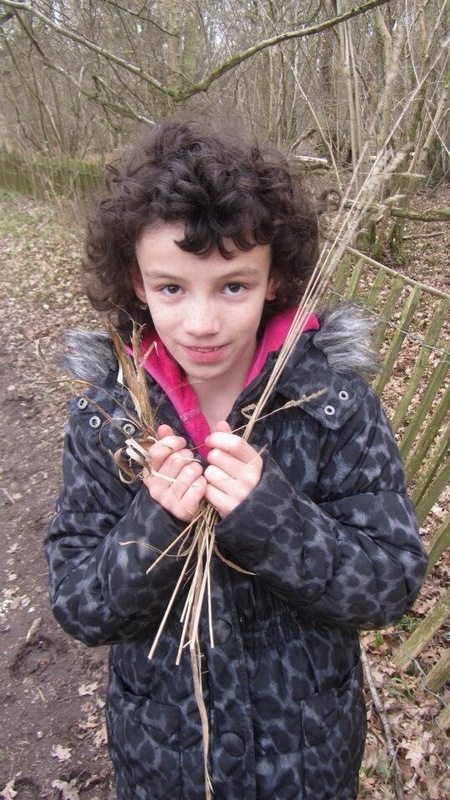 One of Mollie’s specialisations is basketry and she loves to pass that knowledge onto others. Mollie had planned to run classes that day but due to some last-minute changes by the local NT organisers she was only allowed to run some demonstrations. The Vyne is a large estate so we spent the day going off on adventures and then popping back to Mollie’s stall to sneak in a bit of basketry. 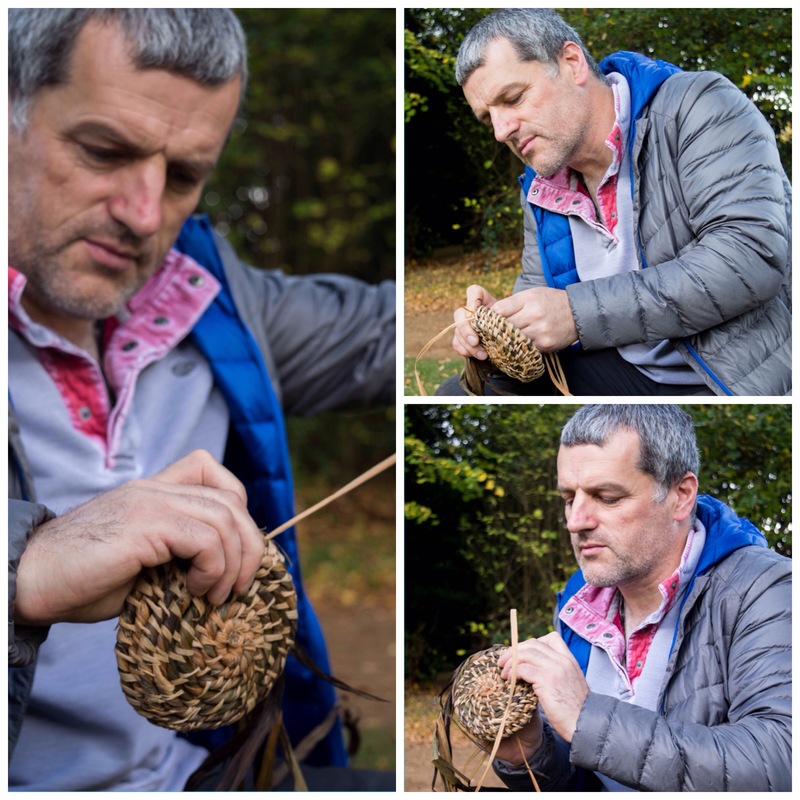 My wife Alison and the kids got chatting to one of the NT volunteers who was using a rather strange device, an oval-shaped nest of wires, designed to pick up fallen apples. 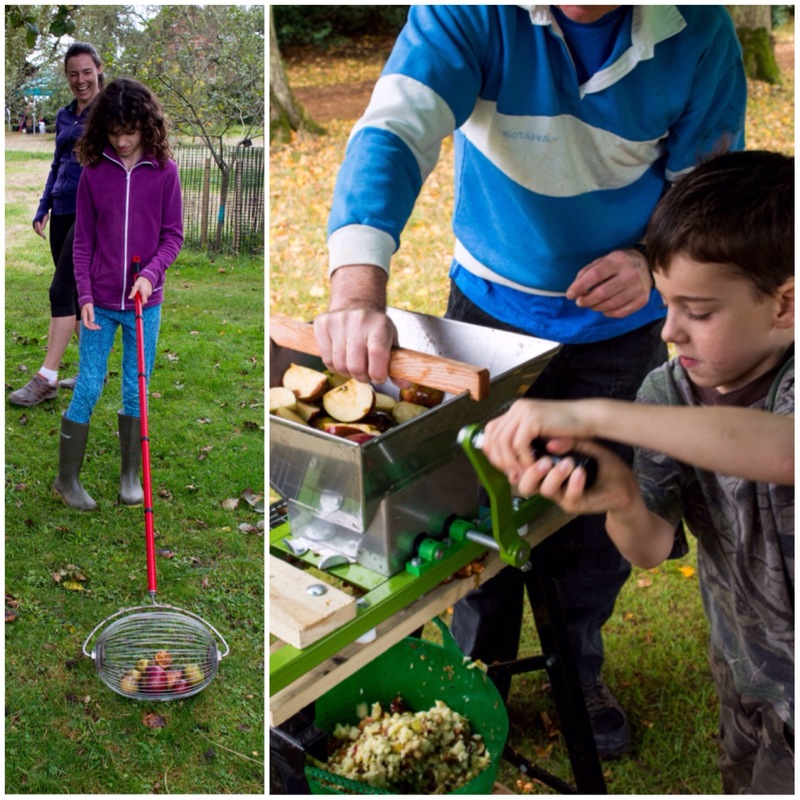 It was a simple but genius system allowing you to collect lots of apples without bending over, and without damaging them in any way. As the wires rolled over each apple they parted to let it in, then sprang back into shape again to hold it securely inside with all the others. Once the apples were collected it was off to the device that shredded them ready for pressing. As this was October the leaves were just turning. I loved the browns, yellows and greens that were all around. 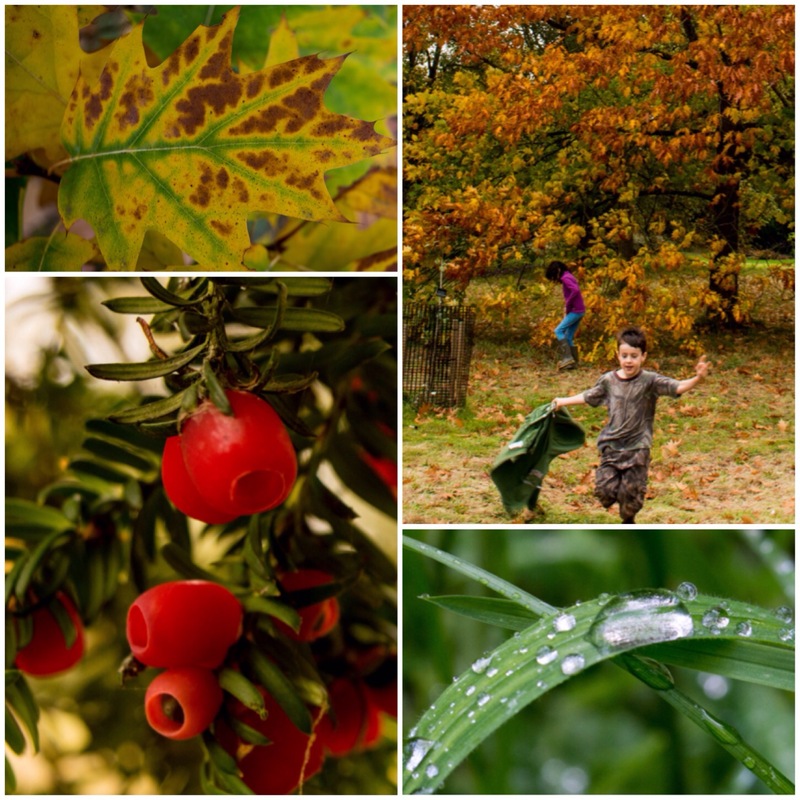 The yew was heavy with red fruit and the dew was still lingering in shaded areas of the grass – all quite beautiful. My kids wandered off to the woods to play and I bimbled back to chat with Mollie. 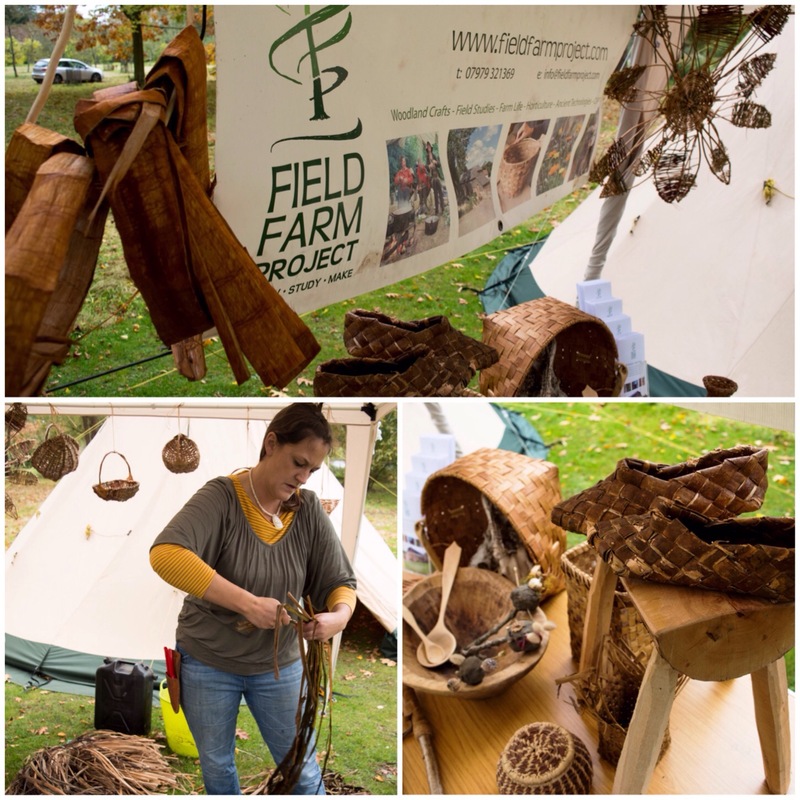 The Field Farm Project is really gaining strength nowadays with a wide range of courses being run. 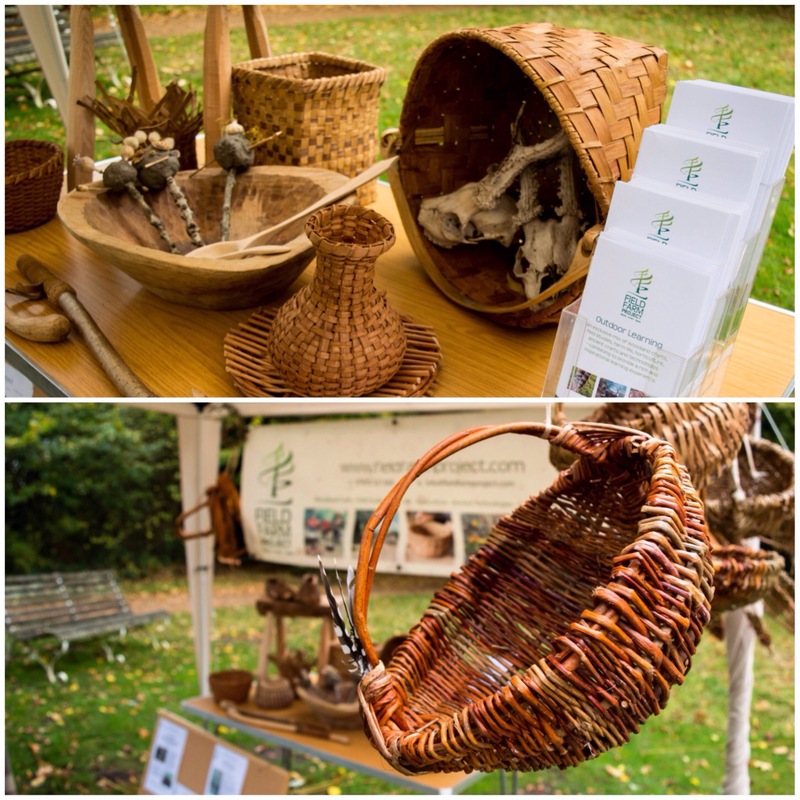 They have bushcraft courses for children, basketry courses and bow-making courses and they are experimenting with growing many different foodstuffs all year round. 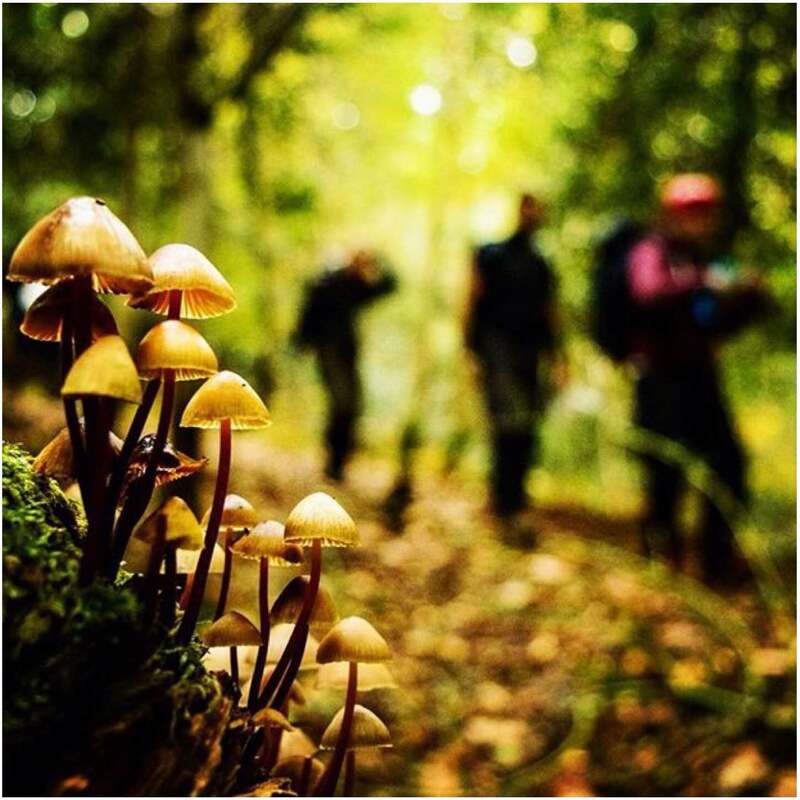 For schools, Mollie and Nick offer courses for Key Stages 1 through to 4 covering many different types of learning in the natural environment. Finlay was a bit disappointed not to get in on the act but we had some great adventures in the woods together that day. 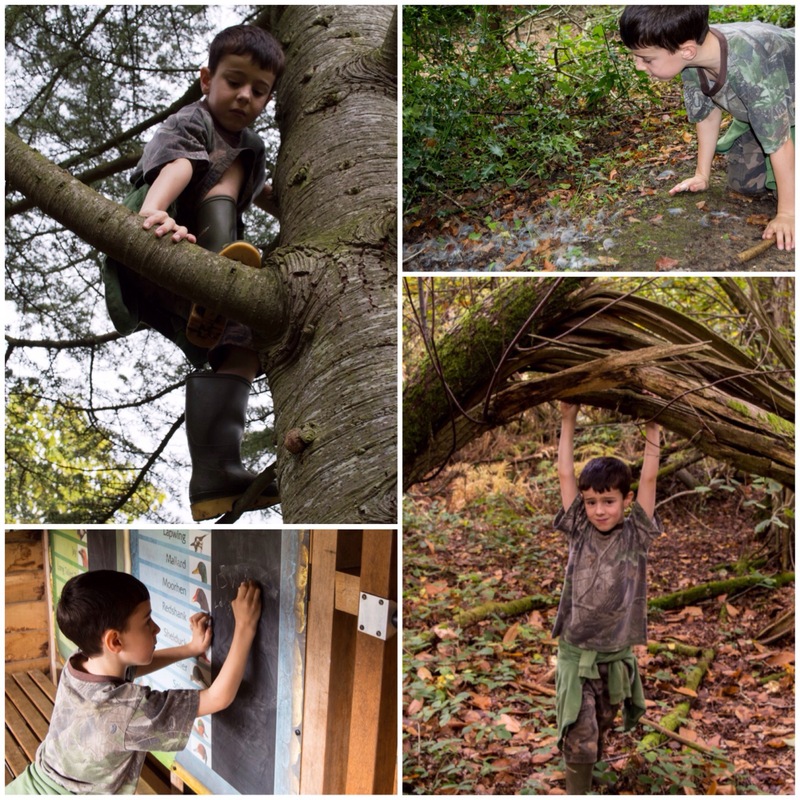 I teach outdoor education to city children and I am fully aware that the majority of kids do not truly get to explore outdoors these days – I try wherever possible to let my kids run free and discover nature for themselves. We had a great time climbing, finding kill sites, spotting birds and just generally larking about. 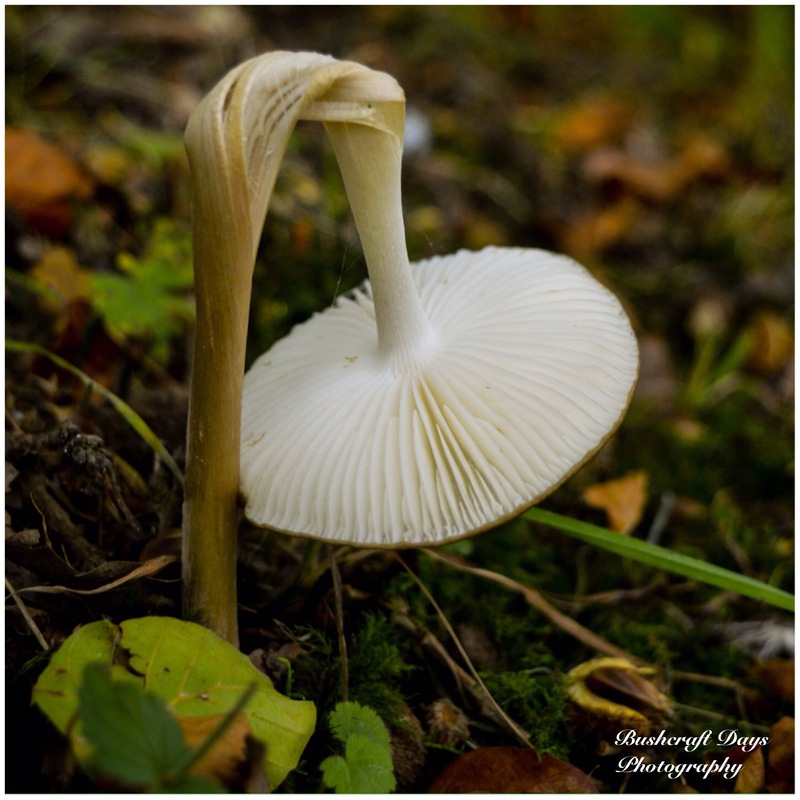 I love to find fungi and photograph them. 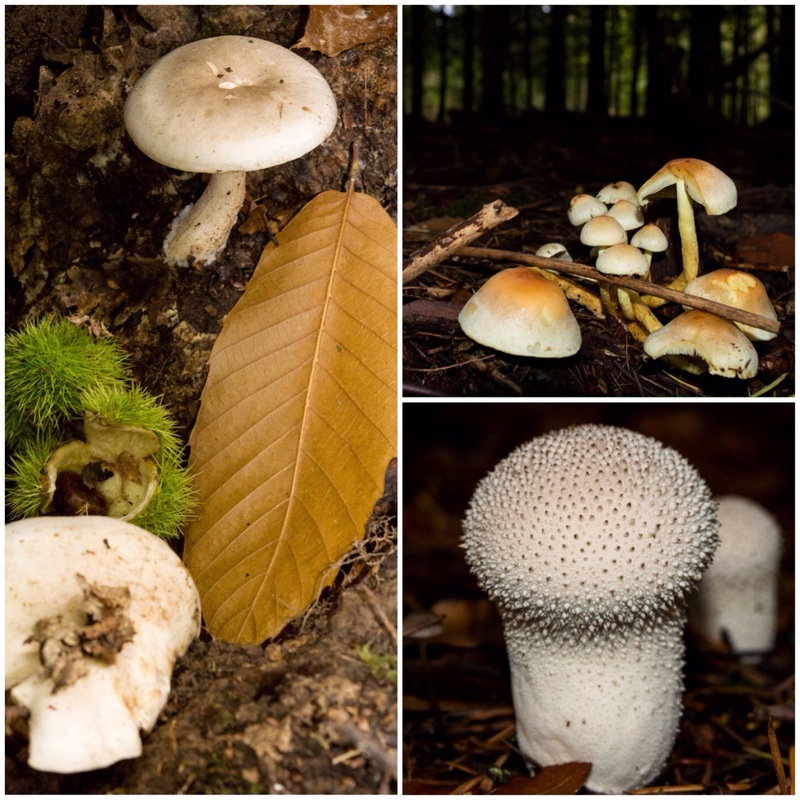 I can identify ones that I know are edible or have some sort of bushcraft use but in the set of pictures below the only one I could hazard a guess at would be the small puffball in the bottom right. As well as the basketry and the carvings on Mollie’s stall, I spotted what I know as a Blobster, a character made out of clay (shown on the left). 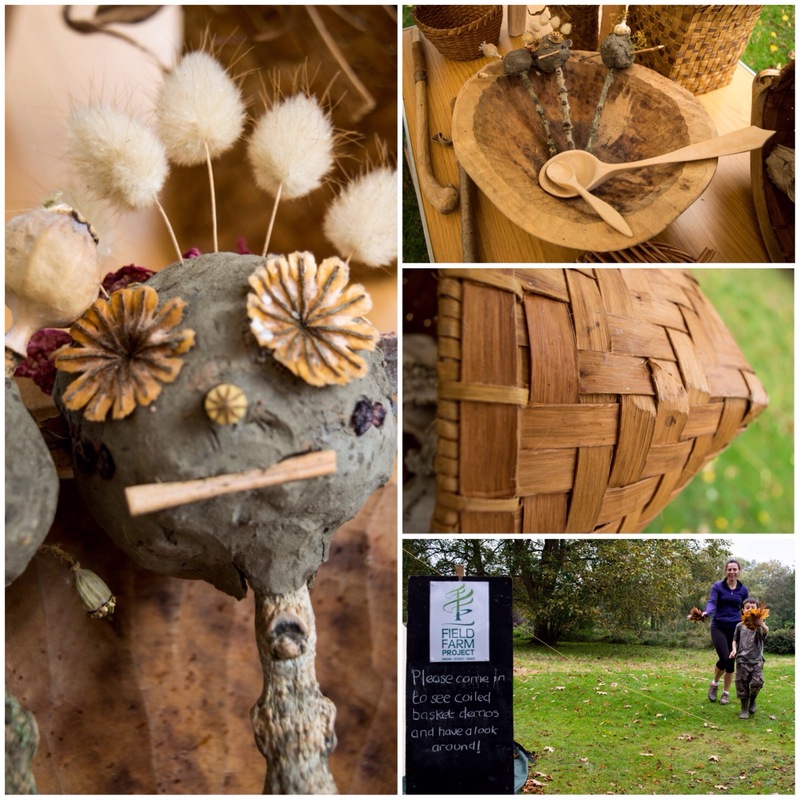 Mollie works with youngsters making these beautiful woodland creations and it is amazing to see what children can make from just the resources they find lying around them. 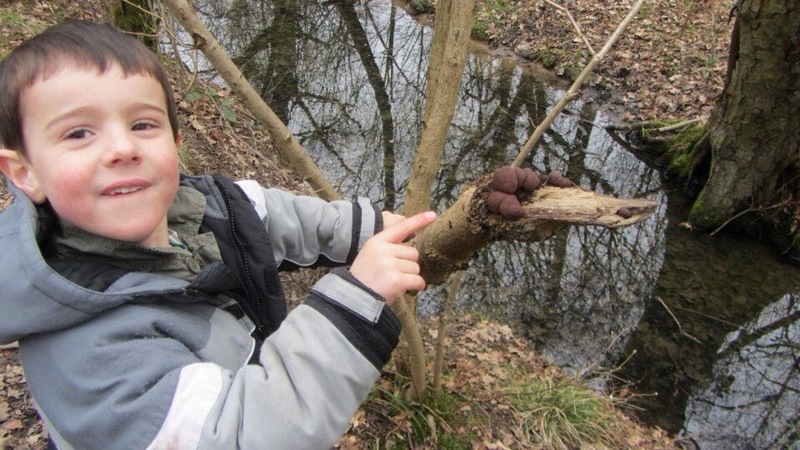 I love this activity myself – the trick is to mould the clay around a small twig to provide support. You can create whole communities from mud, twigs and leaves. To finish my day I spent a little while trying out coiled basketry. This is such a simple art but has the potential to create very beautiful baskets in the right hands. Mollie can do that but I think I need a bit more practice. It was great to catch up with Mollie again and I know that Alison, Catherine and Finlay had a great day as well. 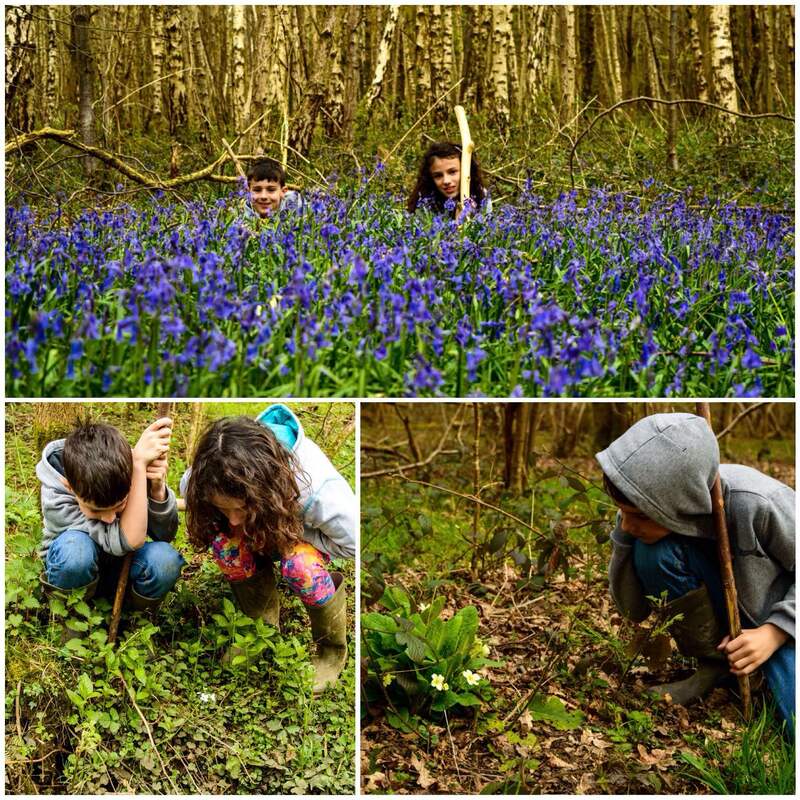 The Field Farm Project is going from strength to strength and I am looking forward to seeing all the adventures they get up to in the coming year. July, August and September were very busy months for me this year so I did not post up much about the bimbles around my local village of Bramley. Part of this was due to receiving a rather lovely birthday present in September from my wife Alison of a new Nikon D3200 DSLR camera. I have never owned a camera that requires anything more than point and shoot before so I have spent many an evening reading up on it and practising. Some of the pictures in this post have been taken with my Nokia phone and some with my new DSLR. I have put up just a few of the many pictures I have taken over the last two months and separated them into categories. I am not that knowledgable about these lovely creatures so had to rely on a guide book to ID them. 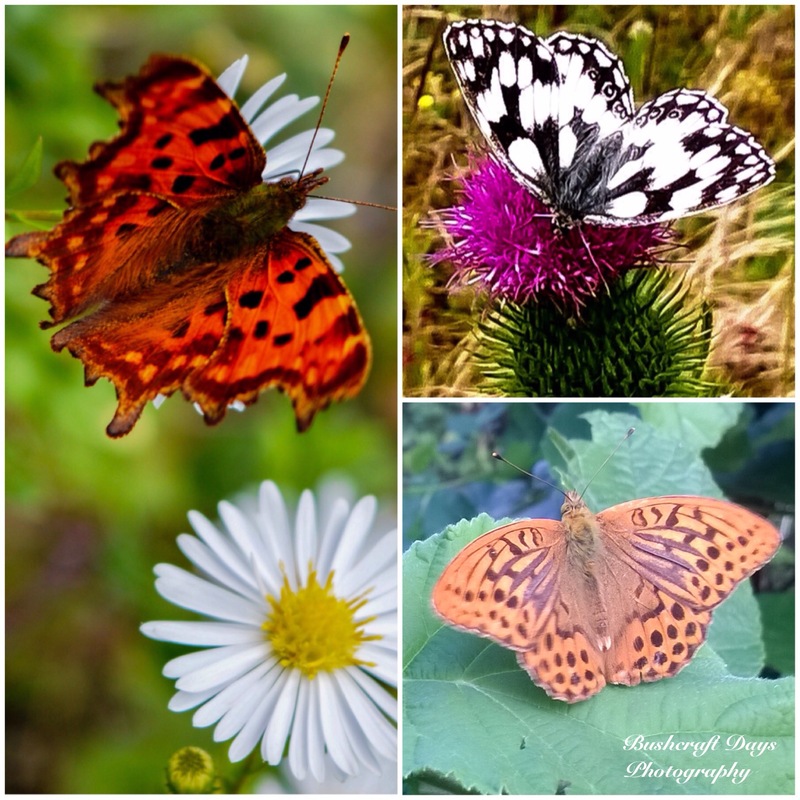 The three below from top left clockwise are a Comma Butterfly, a Marble White and a Silverwashed Fritillary. 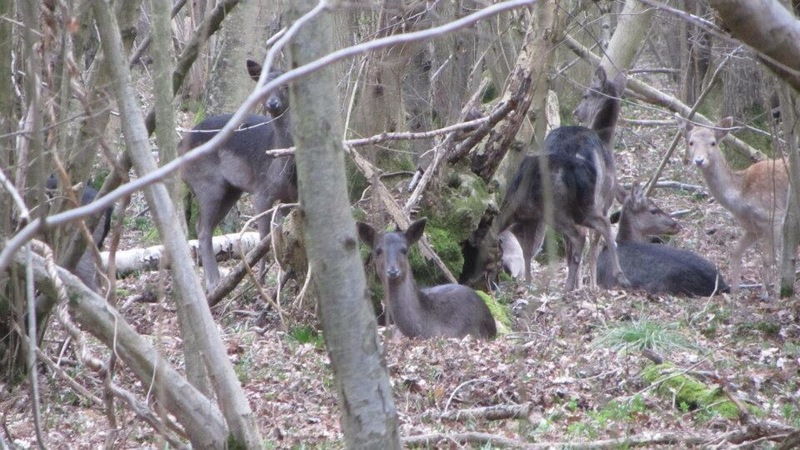 All were photographed in woodland glades enjoying the sunlight. As usual flowers are my passion with the range of smells, colours and textures they offer. 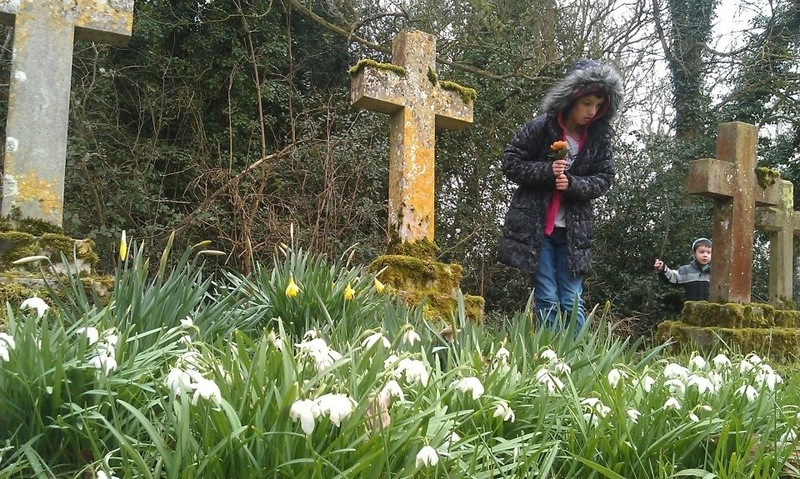 I am still confused by some flowers I find in and around the woods by our village – there must be lots of garden escapes. The yellow flower my daughter is looking at was a late bloomer; I could not identify it from my books but she liked it. The cornflower is always a nice find but the most unusual I spotted was at The Vyne National Trust property on the outskirts of Bramley. The little flower on the bottom right was sitting on top of a perfectly manicured hedge and was too good a shot to miss. 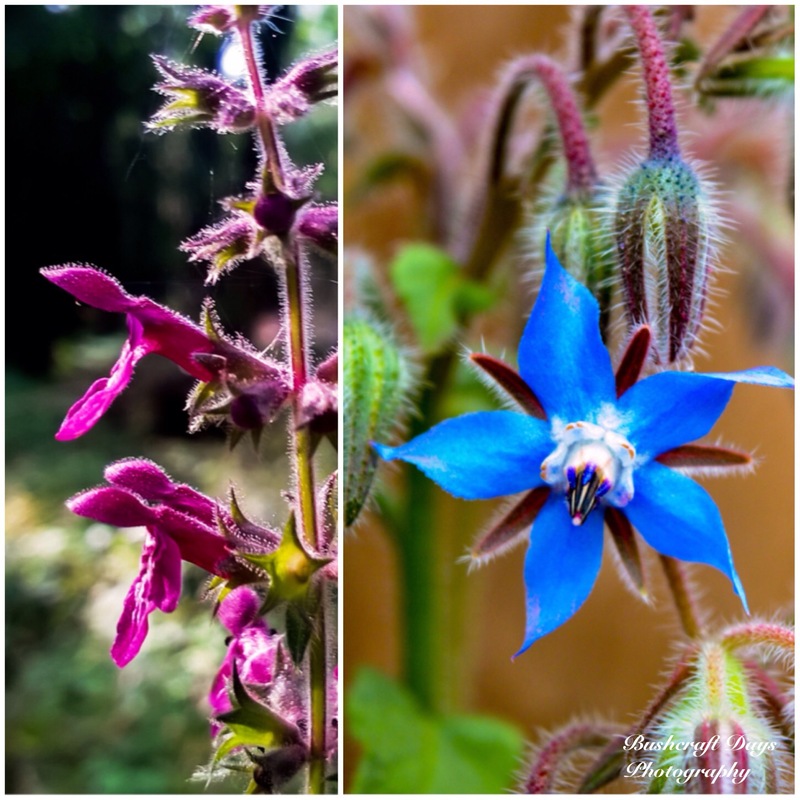 Two beautiful plants for late summer are Woundwort and Borage. 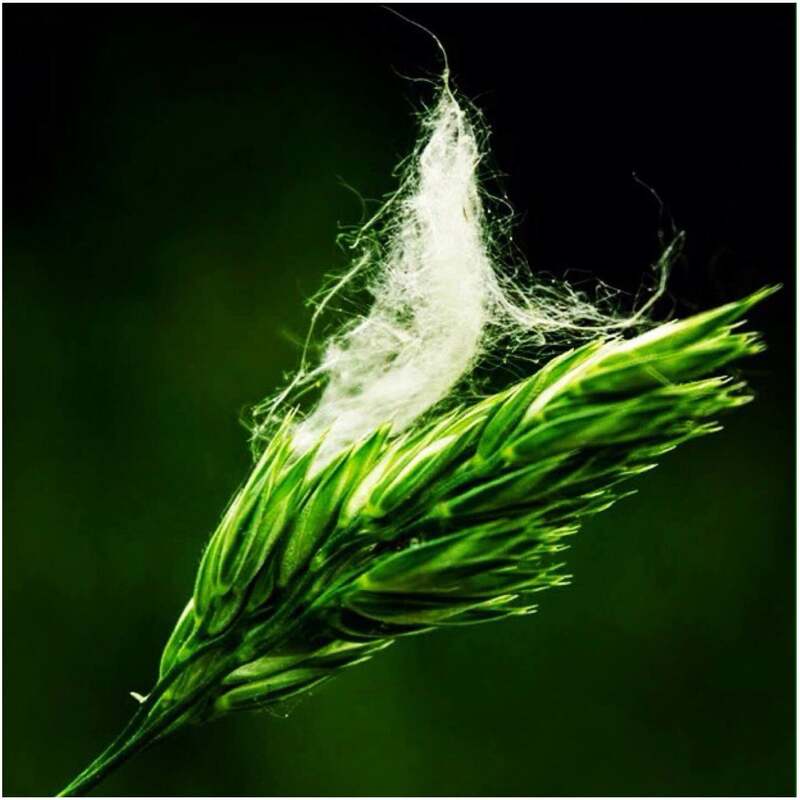 Both plants have been used medicinally in the past, for treating cuts and kidney problems respectively. 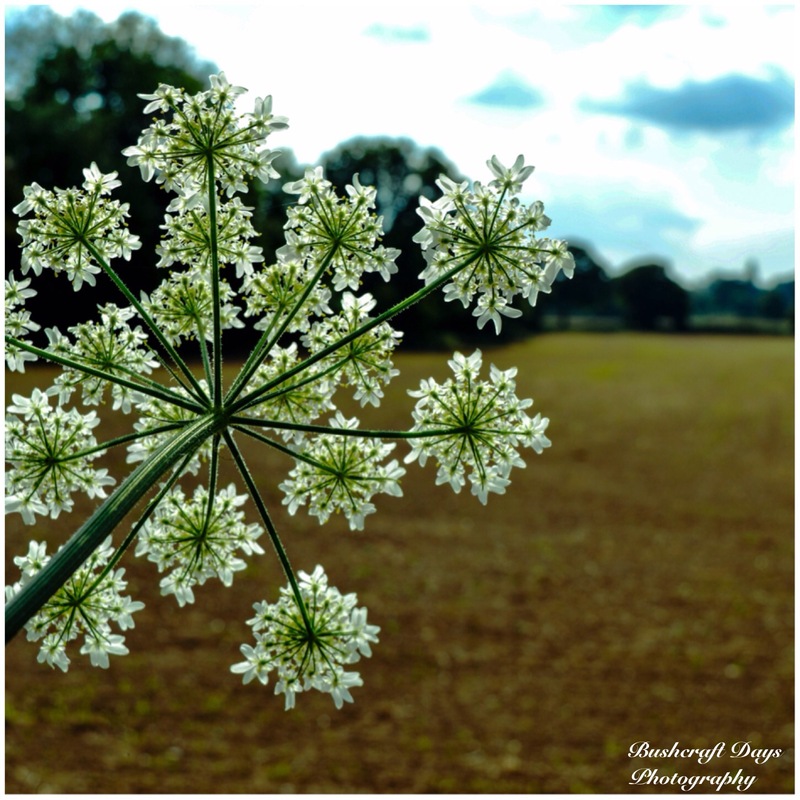 Ok not a flower but the flowering heads of the hogweed when caught at the right angle and light turn into a thing of beauty. I luckily have a local woodland next to me that has a carpet of wild strawberries. In the summer it was great to see these little red berries appearing and getting to nibble the odd one before the birds or slugs got to them. I managed to photograph far more hazlenuts this year (bottom left) before the squirrels snaffled them all. I don’t know if that was because I was really looking for them, there were more than usual, there were fewer squirrels about, or a combination of all of the above. As usual though there were plenty of horse chestnuts for my kids to collect. My rucksack always ended up being full of them every time I took the kids out. 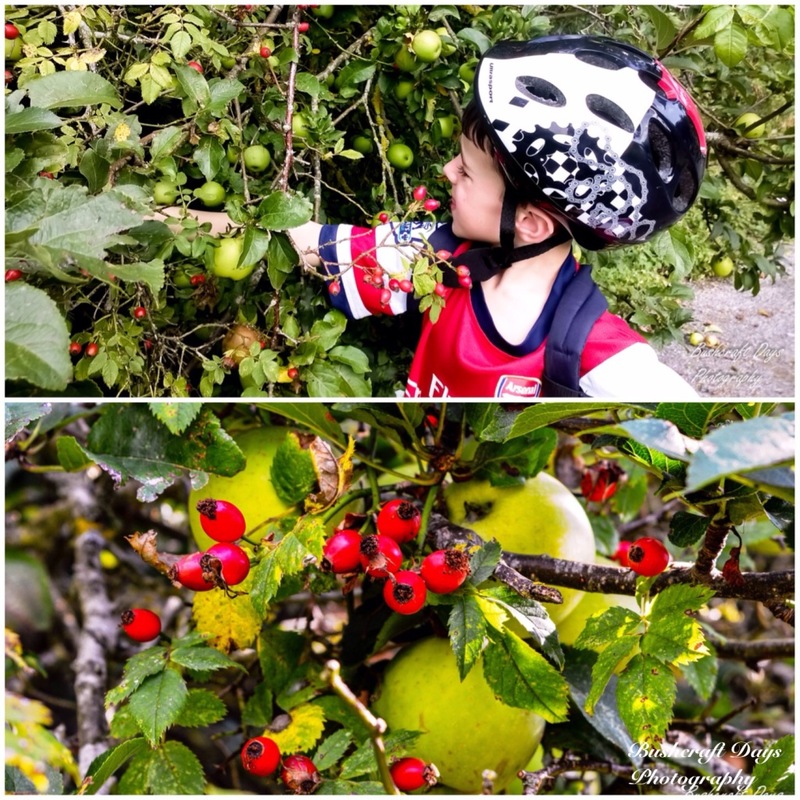 Finlay spotted the apple tree in full bloom and was soon scrumping for apples in its branches. I took the bottom shot as I really liked the contrast of red and green with the rosehips and apples, both beautiful and full of vitamin C.
I have been watching the leaves grow all year and now into the autumn I am watching them start to die off. They can be quite striking though at times with the higgeldy piggeldy white trail of the larvae from the moth larvae Nepticula aurella. 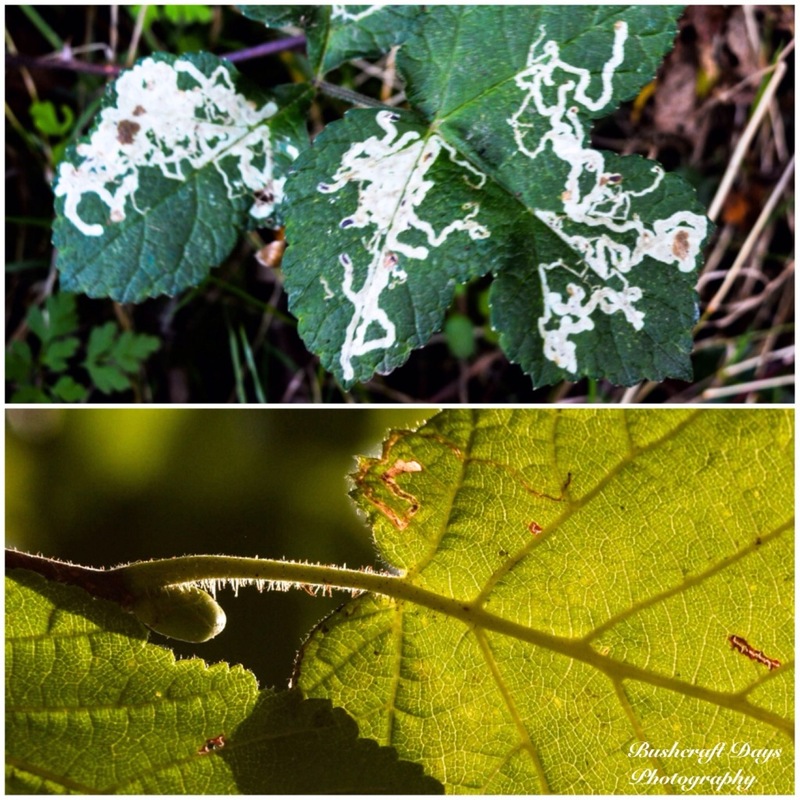 A hazel leaf (bottom picture) may seem quite boring to look at first but if you put it to the light and peer closely then you see a whole new world. The wood aven flower is a lovely yellow colour and the plant has many uses but the flower only lasts a few months. To know it all year round you need to recognise the shape of its leaves and also the spiky seed head it produces (top left). Once you have identified one you will see them all over the place. I like to peer inside the little capsules containing the bluebell seeds just before they fall apart and drop their seeds (bottom left). This is a second period of beauty to me with this plant, often overlooked by most people. 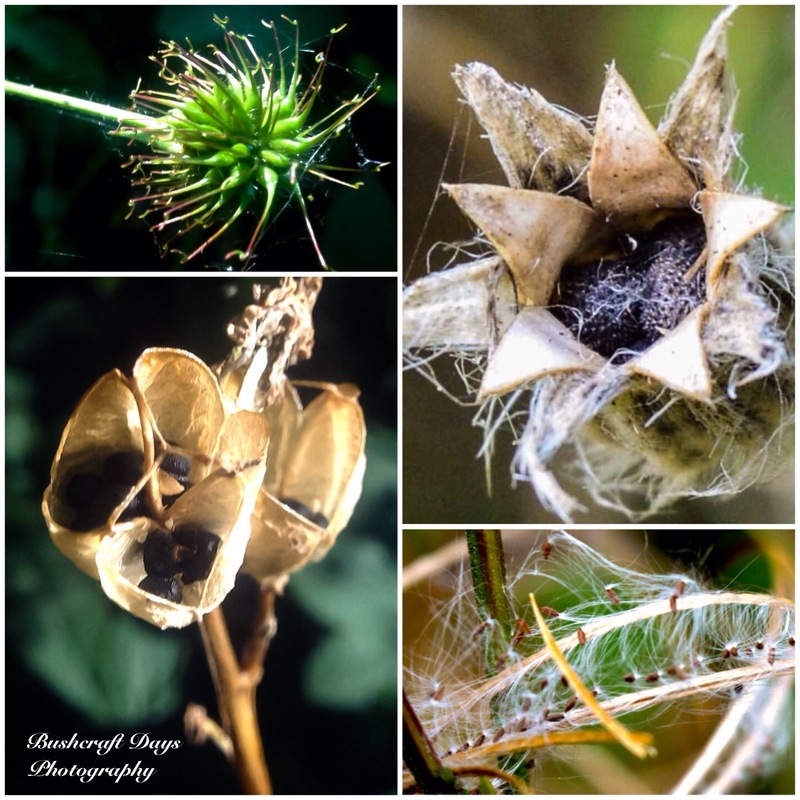 I have no idea what the seed pod in the top right is from (taken in my garden) but it is striking. The last one at the bottom right shows the seeds from the willowherb starting to unfurl. 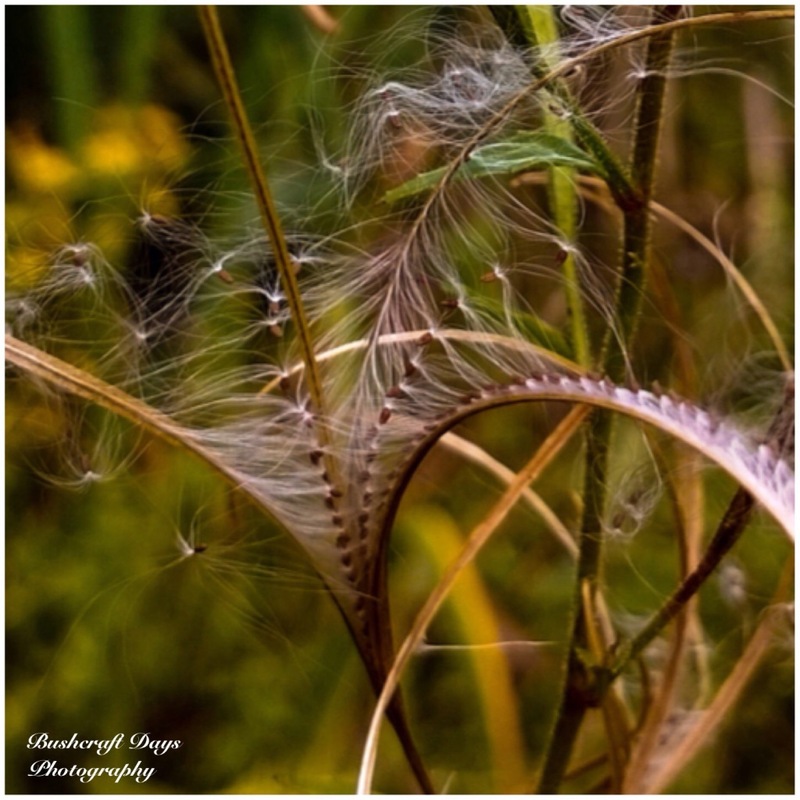 I could not resist putting this picture of the willowherb up on its own as it captures the moment the little hairs with their attached seeds are just starting to float off. I came across this little chap (not my son) Mr Squirrel (though it could have been Mrs Squirrel) lying in the leaf litter on one walk with Finlay. 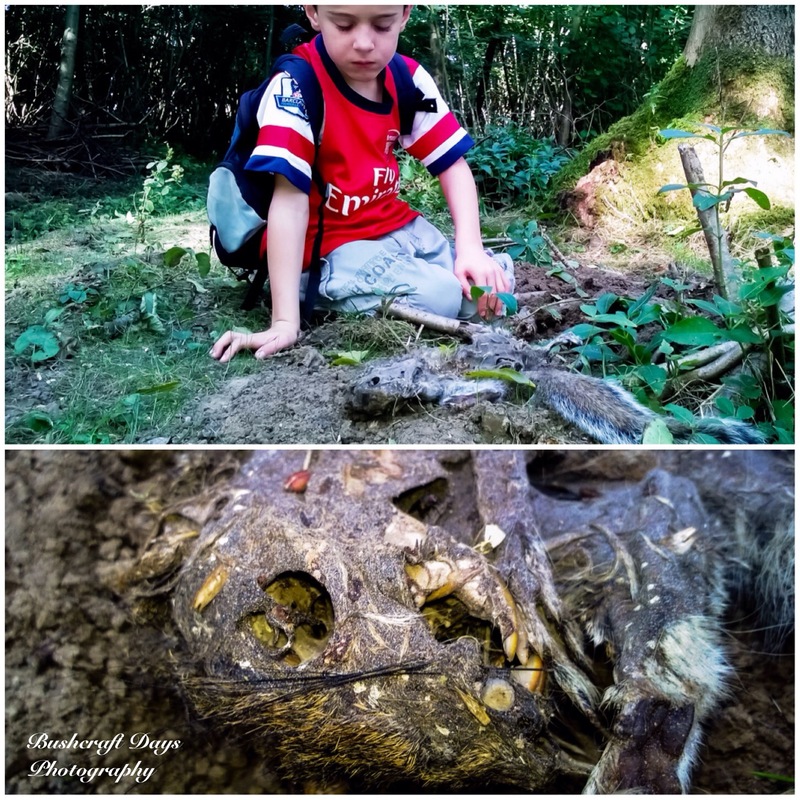 Over a number of weeks we would see this little chap slowly decomposing and both Finlay and myself found it totally fascinating. 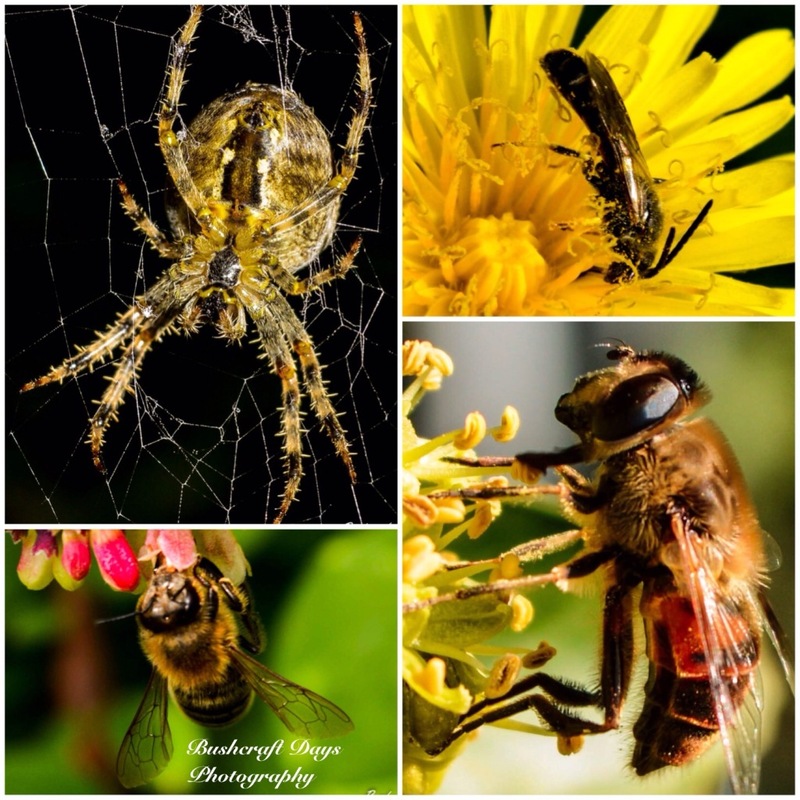 Over the summer I have been trying to get some good macro shots of insects and I was particularly impressed with the spider in the top left picture. I took this one with my new camera as well as the honeybee (I think that is what it is) at the bottom right. The other two were captured using my Nokia phone camera. 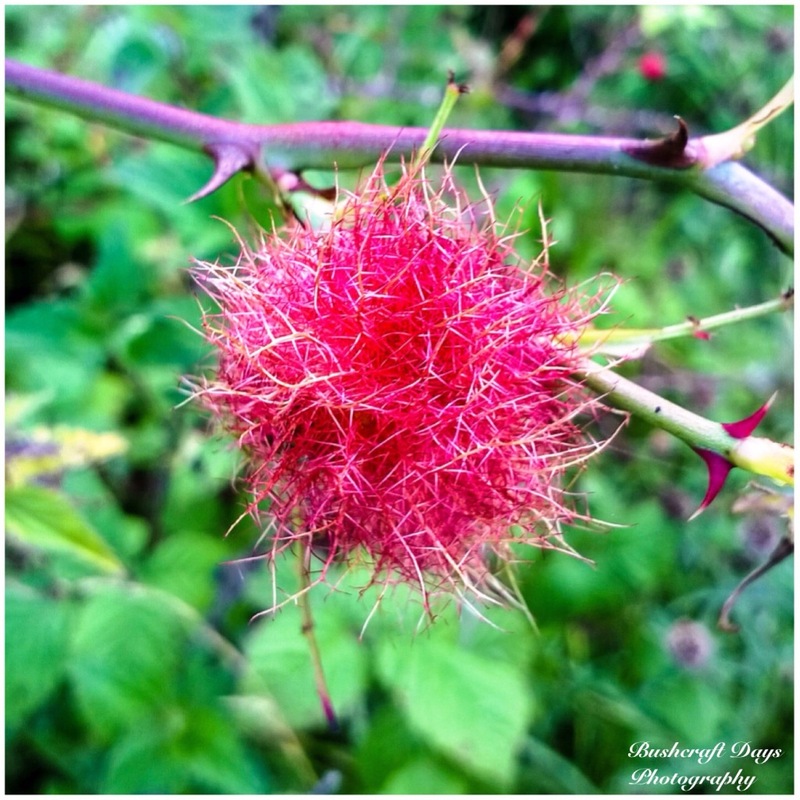 This little packet of pink madness is the red gall of the gall wasp. I found it hanging off a bramble branch and was very confused to what it was at first until I had looked it up. I will be looking out for more of them next year when I will hopefully have some extension tubes for my camera lens so as to take far better macro pictures. 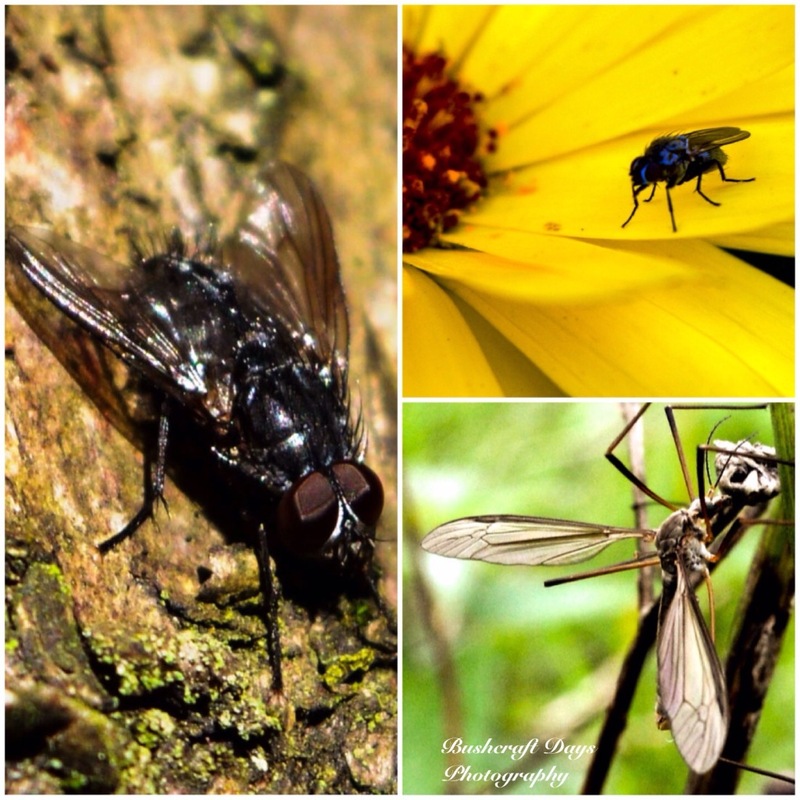 A last little look at the beauty of the small fly and the daddy long legs. My last picture is of one of the few ground-dwelling fungi I spotted over the summer. As far as I am concerned it is an LBJ (Little Brown Jobbie): I do not study these little critters enough to identify the different types of LBJs. I liked this one for the forlorn look it had sitting on its own on the woodland floor after something or someone had snapped it. Thankfully as autumn has progressed more and more fungi have started to pop up all over the woods which I can identify. I had a great summer photographing around my village and look forward to getting some great pictures as the autumn comes to a close and winter sets in. 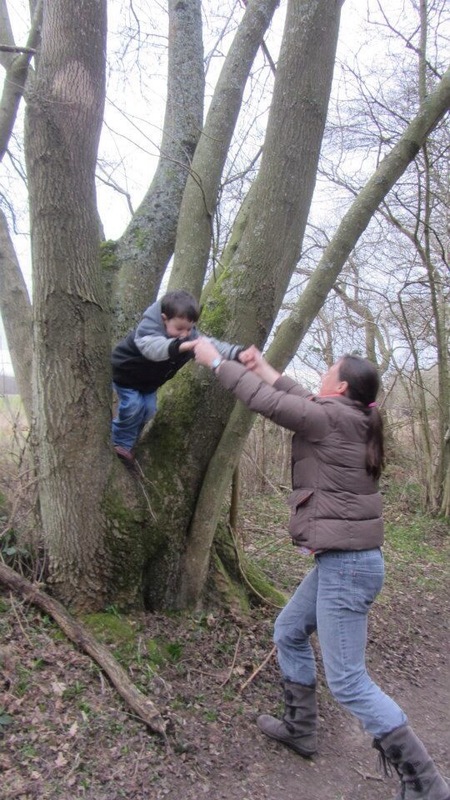 Do I get out and about with my children enough? Probably not but when we do, we like to explore and adventure. 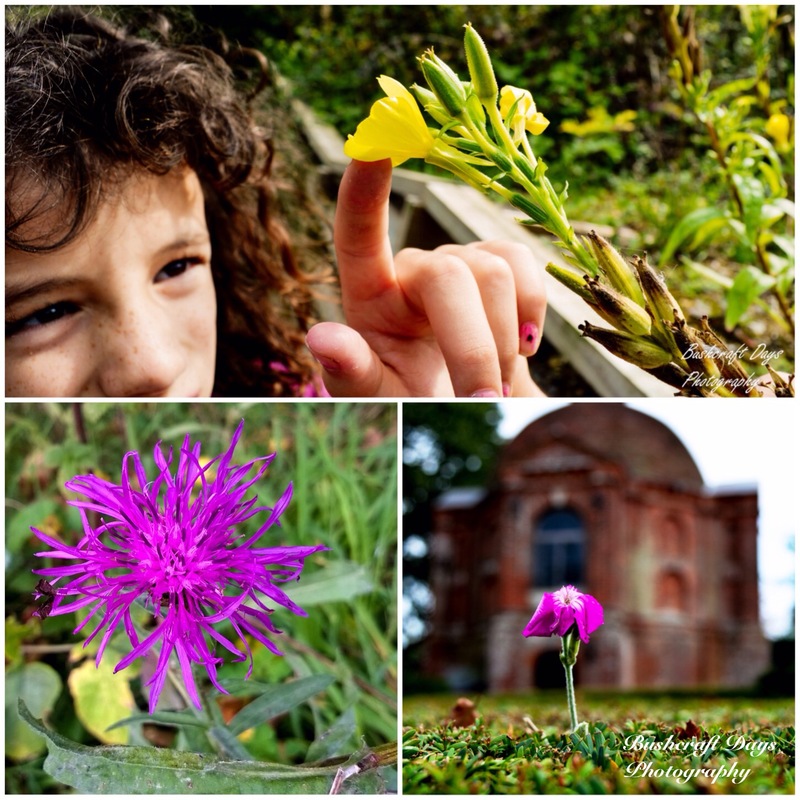 Two particular walks earlier this year stick out in my memory due to the flora and fauna that we came across and the fun we had. 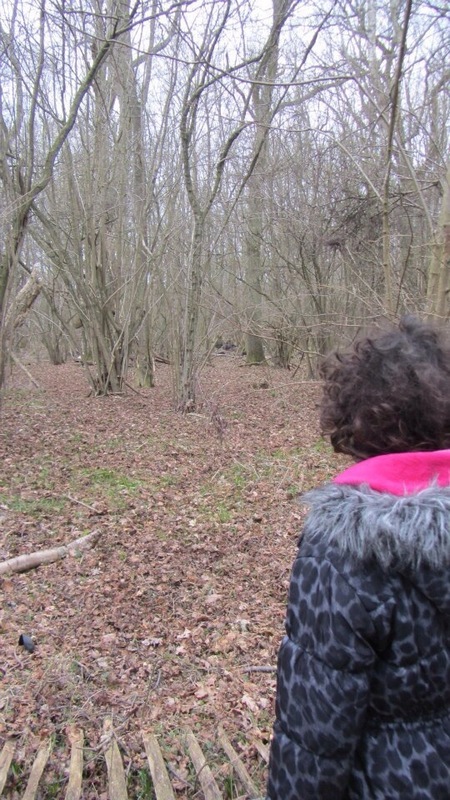 Both walks were in the same piece of woodland near our village. On the way to the woods one of the routes takes you though our local church. The early spring flowers were quite beautiful. 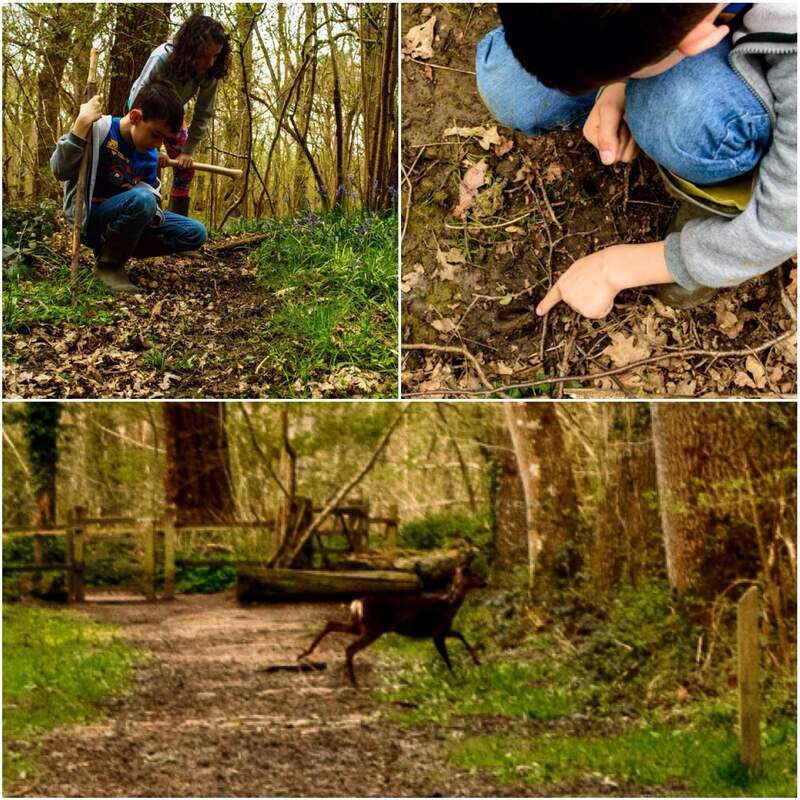 As soon as we entered the woods the kids spotted something. Needless to say it was not just the kids that were excited. Eventually the deer took off. 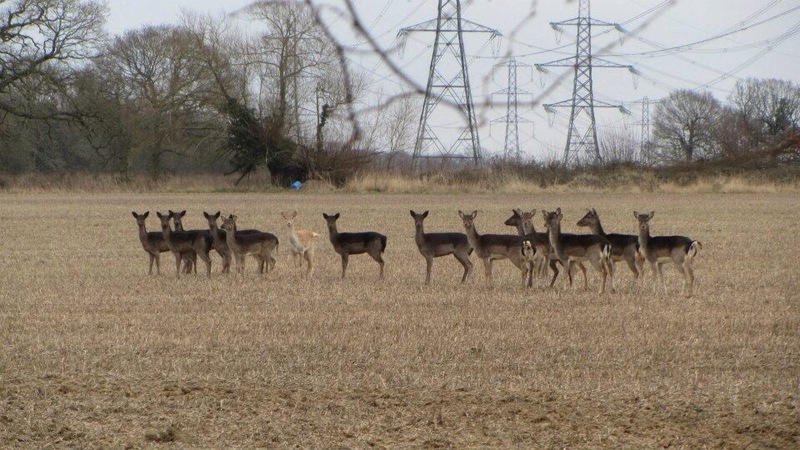 To see a herd of deer move as one is like watching a wave move through the woods. Quite a stunning sight. I was sorry that we had disturbed their rest but still delighted to see them. I was so glad that the kids were with me. Spot the odd man out? We came across a fairly fresh kill site. 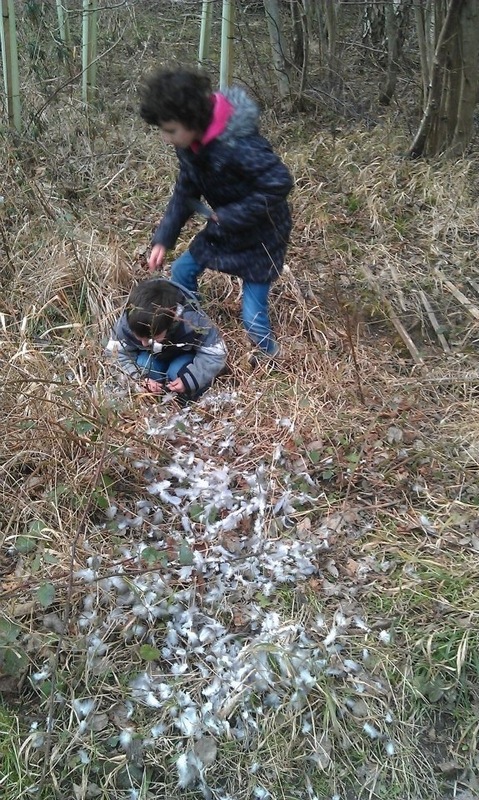 The kids were straight in there looking at the feathers. 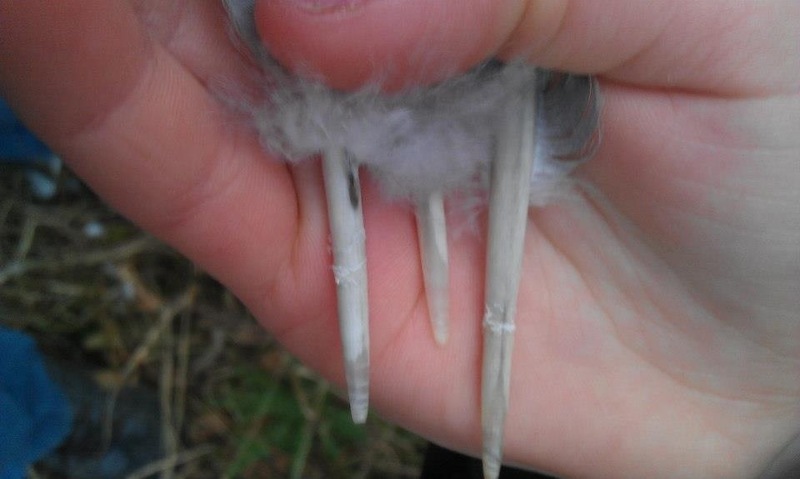 From looking at the feather tips the single score would indicate a bird of prey kill. If it had been a land animal such as a fox the tips of the feathers would have been jagged due to the tearing action of the animal’s teeth. The slots from the deer were crystal clear for them to spot. I did not ask my kids to collect tinder but they just went and collected anyway. Must be in the genes. The next walk was a much more relaxed affair. 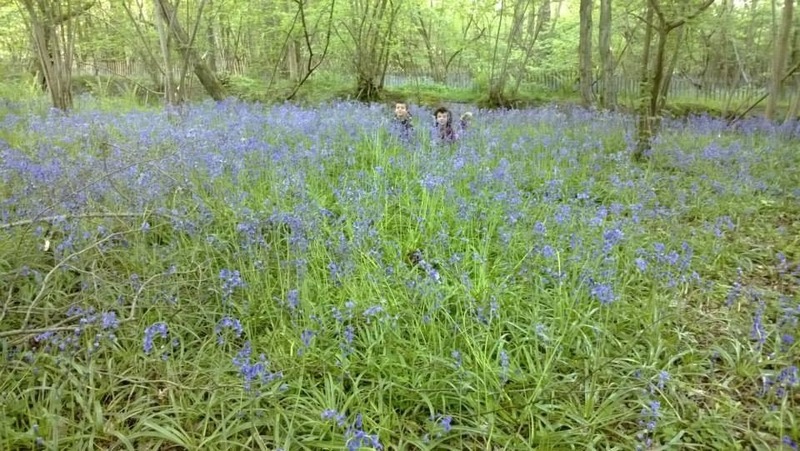 It was time for the Bluebells to appear. Some days Catherine wants to explore and some days nails are more important. Must be a Mars – Venus thing. Thankfully Finlay wanted to do the Mars thing. 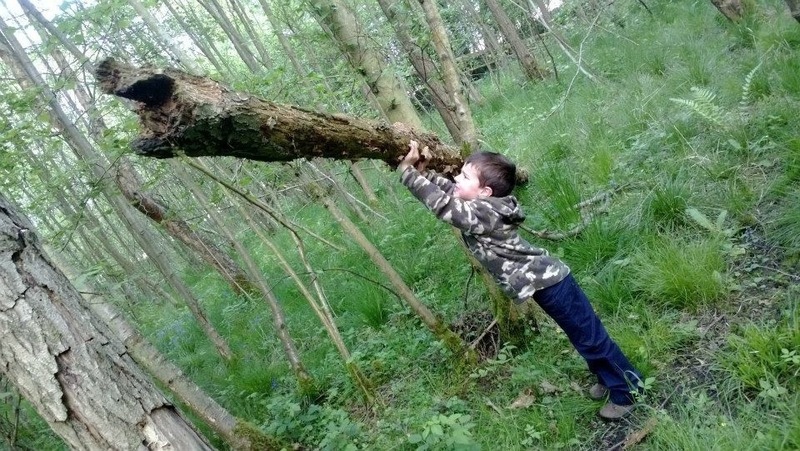 He was determined to be able to lift this tree higher. 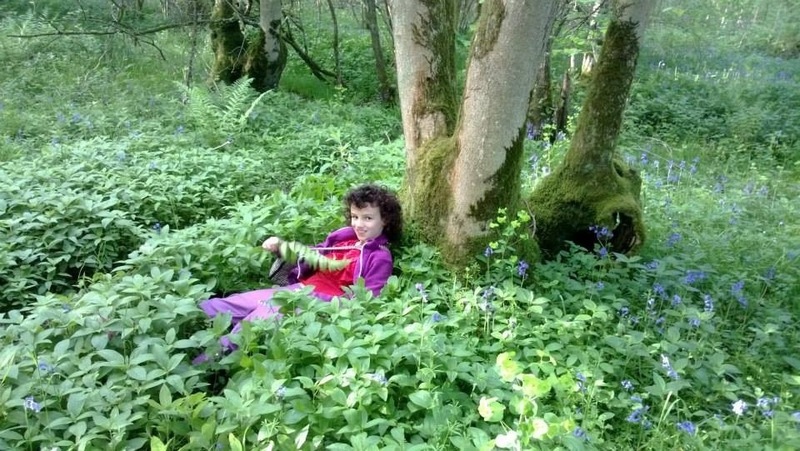 The bluebells were looking beautiful that day. 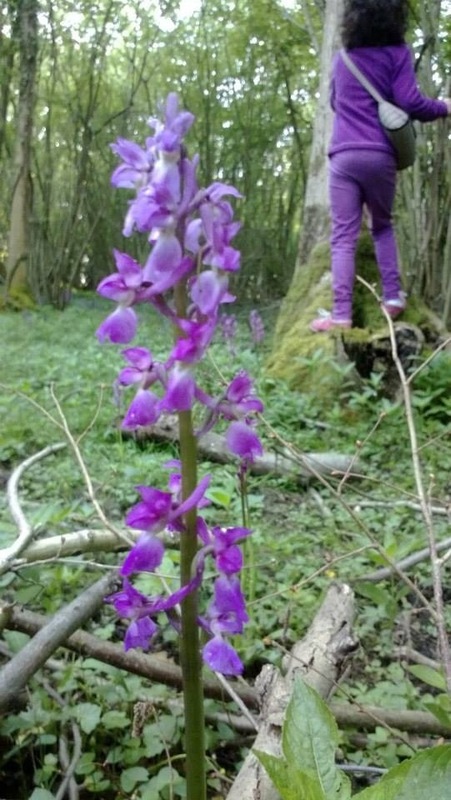 Also the orchids were standing lovely in the woods. 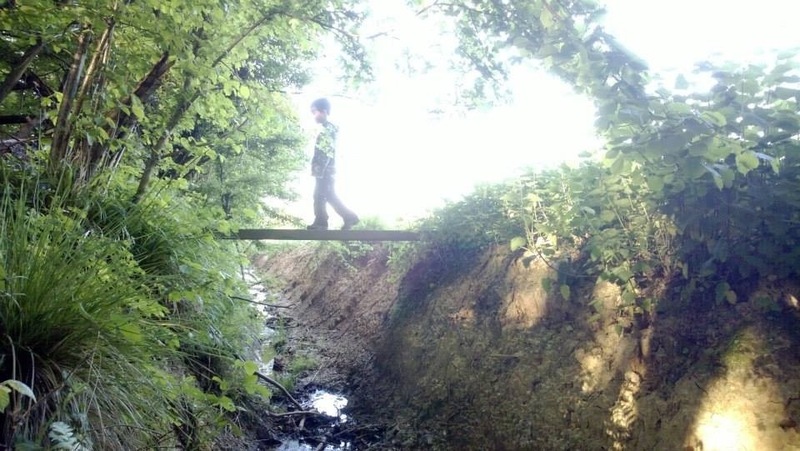 Finlay was more interested in finding bridges to cross and search under for Trolls. 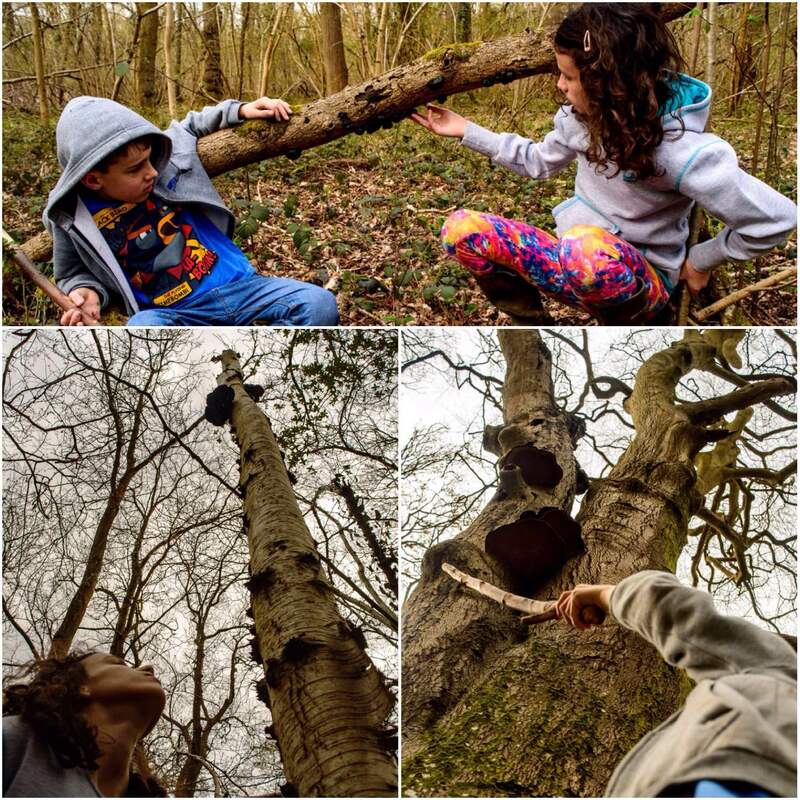 I do love spending time in the woods but it is special when you are with your own family. 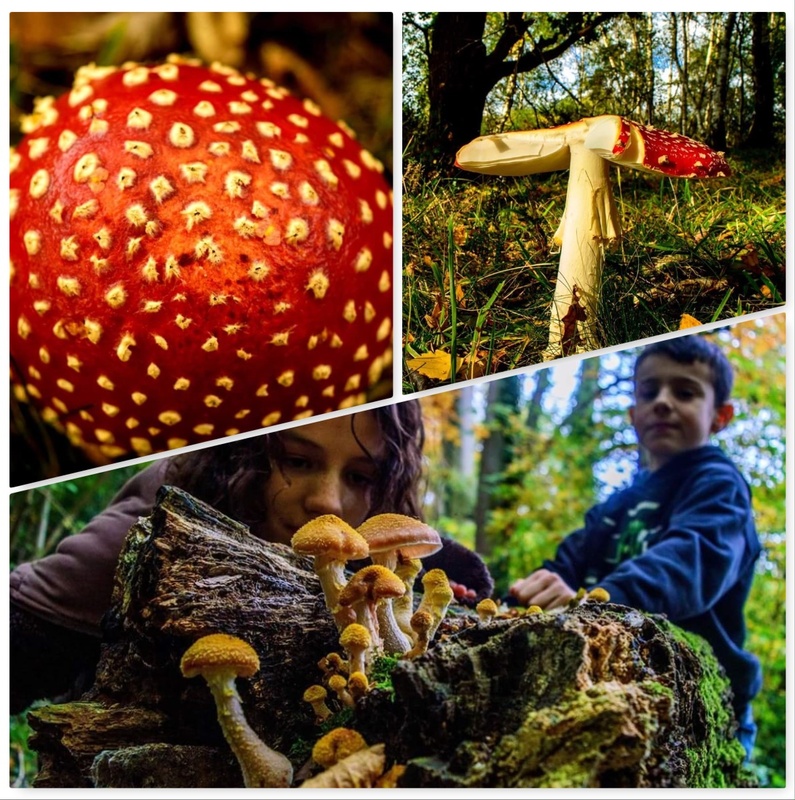 My kids love to use all the latest gizmos but thankfully they love the outdoors just as much.